CD4 and CD8 T cells are vital components of the immune system. We found that histone deacetylase 3 (HDAC3) is critical for the development of CD4 T cells, as HDAC3-deficient DP thymocytes generate only CD8SP thymocytes in mice. In the absence of HDAC3, MHC Class II-restricted OT-II thymocytes are redirected to the CD8 cytotoxic lineage, which occurs with accelerated kinetics. Analysis of histone acetylation and RNA-seq reveals that HDAC3-deficient DP thymocytes are biased towards the CD8 lineage prior to positive selection. Commitment to the CD4 or CD8 lineage is determined by whether persistent TCR signaling or cytokine signaling predominates, respectively. Despite elevated IL-21R/γc/STAT5 signaling in HDAC3-deficient DP thymocytes, blocking IL-21R does not restore CD4 lineage commitment. Instead, HDAC3 binds directly to CD8-lineage promoting genes. Thus, HDAC3 is required to restrain CD8-lineage genes in DP thymocytes for the generation of CD4 T cells. T cells are essential components of the adaptive immune system that directly kill pathogen-infected cells (CD8 cytotoxic T cells) or orchestrate other immune cells in host defense (CD4 helper T cells). The decision to become either a CD8 or CD4 T cell occurs in the thymus. Proper lineage choice involves the coordination of various cellular signals with the regulation of gene expression by lineage dependent transcription factors. According to the kinetic signaling model (reviewed in Singer et al., 2008), lineage choice is determined by TCR signaling persistence versus cytokine signaling. After positive selection, thymocytes downregulate the CD8 coreceptor to become ‘intermediate’ CD4+CD8lo thymocytes to test for coreceptor specificity. MHC class II-restricted thymocytes experience persistent TCR signaling, upregulate the CD4-lineage determining transcription factor ThPOK, and commit to the CD4 lineage. Alternatively, TCR signaling ceases with MHC class I-restricted thymocytes, allowing for common gamma chain cytokine signaling (mainly IL-7R) to predominate, induction of the CD8-lineage determining transcription factor Runx3, and commitment to the CD8-lineage. While many transcription factors have been identified in regulate lineage choice, less is known about the contribution of different chromatin modifiers. HDAC3 is a critical regulator of gene expression. HDAC3 exists in a large (~270 kDa) multiprotein co-repressor complex containing the nuclear receptor corepressor (NCOR) and/or its homolog silencing mediator of retinoic and thyroid receptors (SMRT) (reviewed by Karagianni and Wong, 2007). HDAC3 can also associate with p300 coactivator complexes (Zhang et al., 2016) to modulate histone acetyltransferase activity. HDAC3 does not have a DNA-binding domain, therefore it must be recruited to different areas of the genome via interactions with different transcription factors. Within the nucleus, HDAC3 can be found at promoters or enhancers and functions to deacetylate specific lysine residues on histones H3 and H4. Therefore, HDAC3 is a dynamic protein that represses gene expression depending upon the complexes HDAC3 interacts with and where it is recruited in the genome. HDAC3 is ubiquitously expressed and plays important and specific roles in cell biology and disease. Genomic deletion of HDAC3 is embryonically lethal due to defects in gastrulation (Montgomery et al., 2008), therefore conditional knockout models are necessary to elucidate HDAC3 function in particular cell types. Within the immune system, HDAC3 is important for the maintenance of hematopoietic stem cells (Summers et al., 2013), peripheral T cell maturation (Hsu et al., 2015), regulatory T cell development and function (Wang et al., 2015), iNKT cell development and differentiation (Thapa et al., 2017), B cell development (Stengel et al., 2017), and macrophage function (Mullican et al., 2011). In addition, HDAC3 is required during thymocyte development for positive selection and CD4-lineage development (Philips et al., 2016; Stengel et al., 2015). Mice with CD2-icre-mediated deletion of loxP-flanked Hdac3 (CD2-icre HDAC3-cKO, referred to as HDAC3-cKO) exhibit a positive selection block due to the failure to down-regulate RORγt (Philips et al., 2016). Deletion of RORγt and transgenic expression of Bcl-xl corrects the positive selection defect in HDAC3-cKO mice (RORγt-KO Bcl-xl Tg HDAC3-cKO, referred to as RB3), as RORγt-KO corrects for the failure to down-regulate RORγt and the Bcl-xl transgene restores the DP-survival defect in RORγt-KO mice (Philips et al., 2016; Sun et al., 2000). However, thymocytes almost exclusively develop into CD8SP with very few CD4SP (Philips et al., 2016). RORγt-KO Bcl-xl Tg mice exhibited normal numbers of CD4SP and CD8SP thymocytes (Philips et al., 2016), demonstrating that the defect in CD4-lineage development in RB3 mice is specific to HDAC3. Here, we elucidate how HDAC3 is essential for CD4-lineage commitment. The failure to generate CD4-lineage cells is due to the redirection of MHC class II-restricted thymocytes to the CD8-lineage. After positive selection, HDAC3-deficient thymocytes exhibit a failure to induce the CD4-lineage program and acceleration of commitment towards the CD8-lineage. 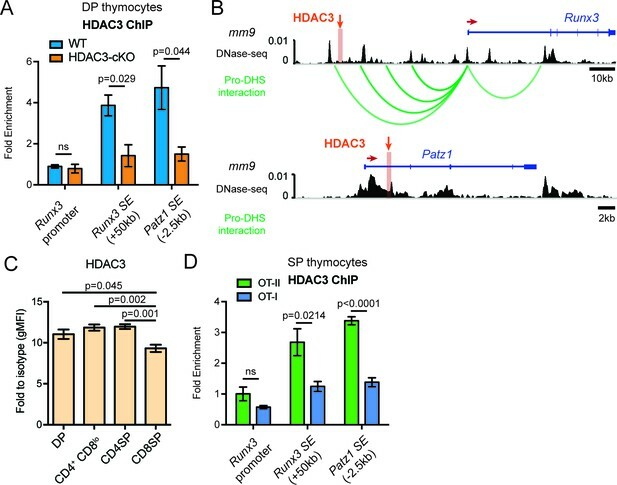 HDAC3 binds to regulatory elements of CD8-lineage promoting genes Runx3 and Patz1 in DP thymocytes, and deletion of HDAC3 results in an increase in histone acetylation and mRNA levels. In addition, HDAC3 binds to Runx3 and Patz1 regions in OT-II CD4SP thymocytes and was absent in OT-I CD8SP thymocytes. Therefore, our data demonstrates that HDAC3 functions in DP thymocytes to repress CD8-lineage genes in order for DP thymocytes to maintain a bi-potential state. To examine why few CD4SP thymocytes develop in RB3 mice, T cell development was examined in RB3 mice expressing a transgene encoding the OT-II MHC class II-restricted TCR (Barnden et al., 1998). While mature SP thymocytes and splenic T cells from OT-II mice were primarily CD4+ cells, OT-II RB3 mice generated CD8+ cells (Figure 1A). In addition, mature SP thymocytes from OT-II RB3 mice expressed Runx3 and lacked ThPOK expression (Figure 1B), demonstrating that MHC class II-restricted thymocytes are re-directed to the CD8-lineage in OT-II RB3 mice. Control OT-II RORγt-KO Bcl-xl tg (OT-II RB) mice showed normal commitment to the CD4 lineage (Figure 1A–B), indicating that the redirection observed in OT-II RB3 mice is a result of HDAC3 deletion. Redirection was not dependent on Bcl-xl expression, as OT-II RORγt-KO HDAC3-cKO mice also showed redirection to the CD8-lineage compared to OT-II RORγt-KO mice (Figure 1C), despite a reduction in the number of SP thymocytes in RORγt-deficient mice. To determine whether redirection also led to the acquisition of CD8-lineage function, SP thymocytes from OT-II RB3 mice were TCR stimulated and analyzed for Granzyme b and Perforin production. MHC class I-restricted OT-I cells, as well as OT-II cells and OT-II RB cells, were used as positive and negative controls, respectively. As expected, OT-I cells produced Granzyme b and Perforin, while OT-II and OT-II RB cells did not (Figure 1D). However, CD8SP cells from OT-II RB3 mice made Granzyme b and Perforin upon TCR stimulation (Figure 1D), demonstrating that CD8-lineage cells from OT-II RB3 mice are functionally cytotoxic-lineage cells. MHC class II restricted thymocytes are redirected to the CD8-lineage when HDAC3 is absent. (A) CD4/CD8 profile of mature thymic SP (Vβ5+Vα2+H2K+CD24lo) and splenic T cells (Vβ5+Vα2+) from OT-II, OT-II RORγt-KO Bcl-xl tg (RB) and OT-II RB3 mice. Graphs depict frequency of gated cells from at least three independent experiments (n = 3–5/group) (B) Runx3 and ThPOK expression in mature thymic SP cells from OT-II, OT-II RB, and OT-II RB3 mice (n = 4/group from four independent experiments). (C) CD4/CD8 profile of mature thymic SP from OT-II RORγt-KO and OT-II RORγt-KO HDAC3-cKO mice. Graphs depict frequency of gated cells from at least three independent experiments (n = 3–4/group). (D) Granzyme b and perforin expression in SP thymocytes from OT-II, OT-I, OT-II RB and OT-II RB3 mice. FACS plots were gated on CD4SP cells for OT-II and OT-II RB mice and CD8SP cells for OT-I and OT-II RB3 mice. Bar graphs depict mean ± SEM (n = 3/group from three independent experiments) of the fold change in MFI between unstimulated and TCR/CD2 stimulated conditions. (E) Representative FACS plots of the proportion of CD4SP and CD8SP mature thymocytes from straight BMCs, where bone marrow from OT-II or OT-II RB3 mice were transplanted into B6.SJL or β2m-KO recipients. Mature SP thymocytes were gated as Vβ5+Vα2+H2K+CD24lo. Mice (n = 3–5/group from three independent experiments) were analyzed 8–10 weeks after transfer. (F) Representative FACS plots of the proportion of CD4SP and CD8SP mature thymocytes from mixed BMCs from OT-II (CD45.1-)/B6.SJL (CD45.1+) and OT-II RB3 (CD45.1-)/B6.SJL (CD45.1+) mice. Mature SP thymocytes from CD45.1+ cells were gated as H2K+CD24lo; mature SP thymocytes from CD45.1- cells were gated as Vβ5+Vα2+H2K+CD24lo. Mice were analyzed 8–10 weeks after transfer. (n = 5/group from three independent experiments). To exclude the contribution of TCRs selecting off of MHC class I in OT-II RB3 mice, bone marrow chimeras were generated where bone marrow from OT-II or OT-II RB3 mice were transferred into B6.SJL or β2m-KO recipients. Since the OT-II TCR is MHC class II-restricted, OT-II thymocytes differentiated to the CD4-lineage in β2m-KO recipients (Figure 1E). In addition, thymocytes from OT-II RB3 mice also did not select off of MHC class I, as OT-II RB3-expressing CD8SP cells developed in β2m-KO recipients (Figure 1E). Therefore, CD8-lineage differentiation in OT-II RB3 mice is not due to aberrant selection off of MHC class I. 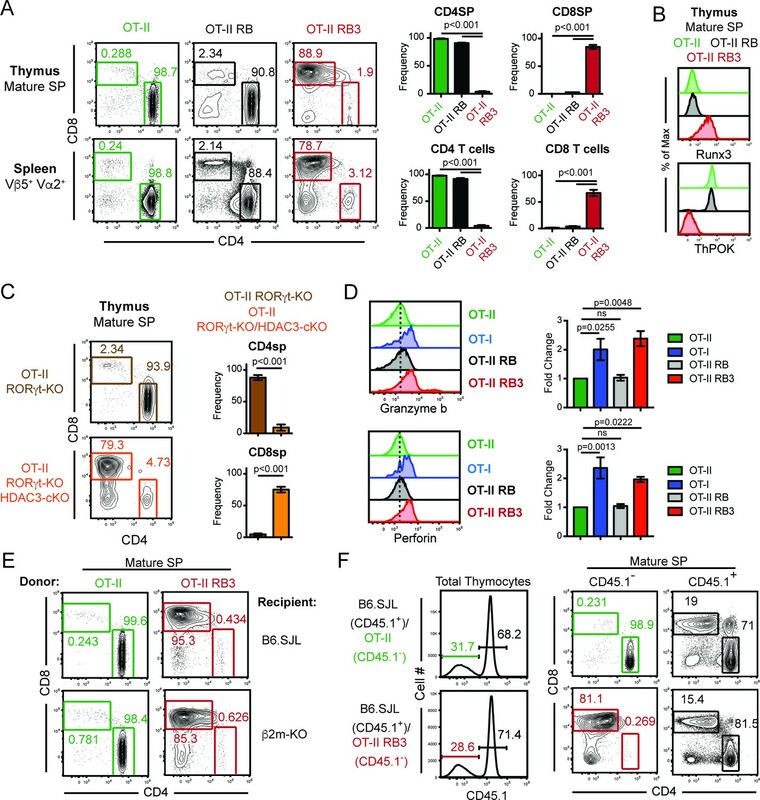 To determine whether redirection of MHC class II-restricted thymocytes to the CD8-lineage is cell-intrinsic in OT-II RB3 mice, mixed bone marrow chimeras were generated. A 50:50 mixture of congenic B6.SJL bone marrow cells were mixed with bone marrow cells from either OT-II or OT-II RB3 mice. As expected, B6.SJL thymocytes and OT-II cells developed normally, while OT-II RB3 thymocytes developed into mature CD8SP cells (Figure 1F), demonstrating that redirection of MHC class II-restricted thymocytes to the CD8-lineage in OT-II RB3 mice is cell-intrinsic and could not be compensated by the presence of WT B6.SJL cells. CD4/CD8-lineage choice is determined by the careful coordination between the lineage-determining transcription factors ThPOK and Runx3, where ThPOK promotes CD4-lineage commitment and Runx3 promotes CD8-lineage commitment (Dave et al., 1998; Woolf et al., 2003). These transcription factors antagonize each other’s expression, while promoting the expression of CD4 or CD8-lineage genes (Sakaguchi et al., 2015; Luckey et al., 2014; Egawa and Littman, 2008; Wildt et al., 2007). To examine whether expression of these lineage-determining transcription factors was altered during lineage commitment in OT-II RB3 mice, we used a previously established gating scheme that outlines three main phases of CD4/CD8-lineage choice defined by CD69 and CCR7 expression ((Kimura et al., 2016), Figure 2A): Phase 0 identifies pre-positive selection thymocytes (Stage 1, CD69-CCR7-), Phase 1 identifies thymocytes that down-regulate the CD8 coreceptor to test for TCR signal persistence (Stages 2–4, CD69+CCR7-/lo/int, highlighted in orange), and Phase 2 identifies thymocytes that have committed to either the CD4 or CD8 lineage (Stages 5–6, CD69-/+CCR7+). In addition to examining lineage choice in OT-II RB3 and OT-II RB mice, OT-I and OT-II mice were used as controls for normal CD8-lineage and CD4-lineage commitment, respectively. As shown previously (Kimura et al., 2016), MHC class I-restricted OT-I-expressing thymocytes decreased CD8α during Phase 1 and re-expressed CD8α during Phase 2, coinciding with CD8-lineage commitment (Figure 2B). In addition, Runx3 was induced during Phase 2 (Figure 2B), demonstrating that Runx3 is expressed when cells commit to the CD8-lineage. 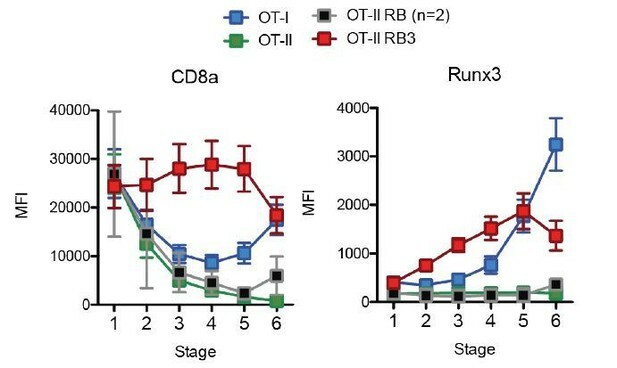 OT-II and OT-II RB thymocytes exhibited a consistent decrease in CD8α expression through Phases 1–2 and no expression of Runx3 (Figure 2B), as expected for MHC class II-restricted thymocytes that commit to the CD4-lineage. However, OT-II RB3 mice showed premature expression of Runx3 during Phase 1 of lineage choice (Figure 2B). This pattern coincides with high CD8α expression during Phase 1 (Figure 2B). Therefore, deletion of HDAC3 leads to an acceleration of commitment to the CD8-lineage. Acceleration of CD8-lineage commitment in HDAC3-deficient thymocytes. (A) Gating scheme outlining two phases of CD4/CD8-lineage commitment—Phase one includes CD69+ CCR7- cells (Stage 2), CD69+ CCR7lo cells (Stage 3), and CD69+ CCR7int cells (Stage 4); Phase two identifies CD69+ CCR7+ cells (Stage 5) and CD69- CCR7+ cells (Stage 6). Orange shading highlights Phase 1. (B) Expression of Runx3 and CD8α during stages of lineage commitment (Stages 1–6), as outlined in (A) from OT-I, OT-II, OT-II RB and OT-II RB3 mice. CD69-versus-CCR7 plots were gated from DN-removed, CD45.2+ cells. (C) Expression of ThPOK during stages of lineage commitment, gated as in (B). Plots in B and C show mean ±SEM of MFI from 5 to 7 mice per group from five independent experiments. Since Runx3 is the lineage-determining transcription factor for the CD8-lineage and can directly antagonize ThPOK expression (Kakugawa et al., 2017), ThPOK expression was also examined during CD4/CD8-lineage commitment in OT-I, OT-II, OT-II RB and OT-II RB3 mice according to the same gating scheme used in Figure 2A. As expected, ThPOK was induced during Phase one in OT-II and OT-II RB mice and maintained at high levels in Phase 2, while in OT-I mice, ThPOK was expressed at low levels during Phase one but repressed at Phase 2 (Figure 2C). The downregulation of ThPOK at Phase two in OT-I mice corresponded with the induction of Runx3 at Phase 2 (Figure 2B–C), illustrating antagonism between Runx3 and ThPOK during lineage commitment. On the other hand, OT-II RB3 mice failed to induce ThPOK expression during Phase 1 (Figure 2C), which coincided with premature expression of Runx3 at this phase (Figure 2B). Altogether, the lower levels of ThPOK in OT-II RB3 mice suggest that as a consequence of acceleration of commitment to the CD8-lineage, factors that mediate CD4-lineage commitment are not induced after positive selection when HDAC3 is absent. To investigate why HDAC3-deficient thymocytes prematurely commit to the CD8-lineage, RNA-seq and ChIP-seq was performed on thymocytes prior to CD4/CD8-lineage commitment. The two FACS-sorted populations analyzed were Immature (Vβ5lo/-CD69-CD4+CD8+) and Selecting (Vβ5intCD69+) cells (Figure 3A, Figure 3—figure supplement 1A) from OT-II and OT-II HDAC3-cKO mice. Immature and Selecting cells identify two developmental stages immediately upstream of CD4-lineage commitment in OT-II mice; Immature cells were DP thymocytes pre-positive selection (Figure 3—figure supplement 1A) and Selecting cells were cells that have received a TCR signal, illustrated by CD69 expression, but had not yet completed positive selection and upregulated TCRβ (Figure 3—figure supplement 1B). During the Selecting phase, thymocytes were also preparing for lineage choice, as they expressed markers that change between DP and CD4+CD8lo thymocytes at an intermediary level (Figure 3—figure supplement 1C). In particular, IL-7R expression on Selecting cells was very low (Figure 3—figure supplement 1C), demonstrating that cells are not ready to undergo lineage choice because they are not yet cytokine receptive as CD4+CD8lo thymocytes are. OT-II TCR transgenic mice were used to determine how HDAC3 deletion affects gene expression and chromatin specifically in MHC class II-restricted thymocytes, and OT-II HDAC3-cKO mice were used opposed to OT-II RB3 mice in order to examine transcriptomic and histone acetylation changes prior to positive selection. HDAC3-deficient thymocytes fail to induce the CD4-lineage program. (A) Flow cytometric analysis of populations from OT-II and OT-II HDAC3-cKO mice sorted for RNA-seq and ChIP-seq. Plots show representative pre-sort and post-sort analysis of two FACS sorted populations—Immature thymocytes (Vβ5loCD69- CD4+CD8+) and Selecting thymocytes (Vβ5loCD69+). (B) Expression of CD4-lineage and CD8-lineage gene sets across DP, CD4+CD8lo, CD4SP, and CD8SP ImmGen expression data. (C–D) Volcano plot depicting the Log2fold change (FC) between OT-II HDAC3-cKO and OT-II Selecting (CD69+) cells. Grey dots show all genes; pink dots show CD4-lineage gene set (C); blue dots show CD8-lineage gene set (D). (E–F) Average H3K27ac ChIP-seq signal at the transcription start site (TSS) between OT-II and OT-II HDAC3-cKO Selecting (CD69+) cells for CD4-lineage gene sets (E) and CD8-lineage gene sets (F). Box-and-whisker plots depict H3K27ac signal at the TSS at CD4- or CD8-lineage genes between OT-II and OT-II HDAC3-cKO mice. Snapshots of example ChIP-seq tracks for each gene set are below. See also Figure 3—figure supplements 1–5 and Figure 3—source datas 1–2. Among the differentially expressed genes (defined by Log2fold change of 1.5 and a false discovery rate (FDR) of <0.05), 449 genes were down-regulated and 164 genes were up-regulated in Immature (DP) cells from OT-II HDAC3-deficient cells compared to OT-II (Figure 3—source data 1). In Selecting (CD69+) cells, 679 genes and 347 genes were down-regulated and up-regulated, respectively, from OT-II HDAC3-cKO mice compared to OT-II mice (Figure 3—source data 1). Alternatively, housekeeping gene expression did not change upon HDAC3 deletion (Figure 3—figure supplement 2A), indicating that deletion of HDAC3 did not change gene expression globally. Rather, there was evidence that CD4-lineage associated genes were down-regulated in OT-II HDAC3-cKO mice. In particular, Zbtb7b (encodes ThPOK) was markedly decreased in Immature (DP) and Selecting (CD69+) cells compared to OT-II (Log2 FC −2.38 and −3.83, respectively, Figure 3—source data 1). This led us to investigate whether genes corresponding to the CD4-lineage or the CD8-lineage were differentially regulated when HDAC3 was absent. To restrict our analysis to genes that distinguish between the CD4 and CD8-lineages, two gene sets were generated using the Immunological Genome Consortium Database (immgen.org, detailed in Materials and methods). To confirm specificity of the gene sets, the expression of these genes in DP, CD4+CD8lo, CD4SP and CD8SP thymocytes was examined. The CD4-lineage gene set showed low expression in DP and CD8SP thymocytes, induction at the CD4+CD8lo stage, and high expression in CD4SP cells (Figure 3B). The CD8-lineage gene set was only expressed in CD8SP thymocytes (Figure 3B). Since expression of the CD4-lineage gene set started at the CD4+CD8lo stage and neither gene sets were expressed at the DP stage, we examined how the CD4-lineage gene set was differentially expressed at the Selecting (CD69+) stage between OT-II and OT-II HDAC3-cKO mice. 64% of CD4-lineage genes in this gene set were significantly down-regulated in HDAC3-deficient cells (Figure 3C). Examples include CD4, Zbtb7b (ThPOK), Itgb3, Nrp1, Cd40lg, and St8sia6 (Figure 3C, Figure 3—figure supplements 2B and 3A). However, 53% of CD8-lineage genes were significantly up-regulated in OT-II HDAC3-cKO cells compared to OT-II (Figure 3D), such as Snai3, Cd8a, Cd8b1, Prf1, Itgae, Gpr114, and Runx3 (Figure 3—figure supplements 2C and 3B). Protein expression showed a similar pattern, as there was a decrease in ThPOK expression and slight increase in Runx3 expression at the Selecting (CD69+) stage in OT-II HDAC3-cKO mice compared to OT-II mice (Figure 3—figure supplement 2D). Of note, this pattern was also observed in OT-II RB3 mice, where there was an increase in Runx3 and decrease in ThPOK protein expression early in lineage choice compared to OT-II cells (Figure 2B–C), illustrating convergence between OT-II HDAC3-cKO mice and OT-II RB3 mice. This distinct pattern suggests that lack of HDAC3 leads to a gene expression pattern predisposed to the CD8-lineage and against the CD4-lineage prior to positive selection. To determine whether the different patterns of gene expression between OT-II and OT-II HDAC3-cKO mice at the Selecting (CD69+) stage was reflective of changes in histone acetylation, the level of H3K27ac and H3K9ac around the transcription start site (TSS) was examined at CD4-lineage and CD8-lineage genes. Interestingly, there were minimal changes in the average H3K27ac signal (Figure 3E) or average H3K9ac signal (Figure 3—figure supplement 4A) at CD4-lineage genes. This was either due to the lack of change in acetylation between OT-II and OT-II HDAC3-cKO cells (e.g. Cd4, Nrp1, Figure 3E, Figure 3—figure supplement 4A) or a decrease in H3K9ac or H3K27ac signal (e.g. Zbtb7b, Figure 3E, Figure 3—figure supplement 4A). However, there was a significant increase in the average H3K27ac signal and average H3K9ac signal around the TSS of CD8-lineage genes (e.g. Cd8a, Cd8b1, Snai3, Runx3, Figure 3F, Figure 3—figure supplement 4B). Consistent with the RNA-seq data, genes that are normally silenced in thymocytes (i.e. macrophage genes, B-cell genes, HSC/progenitor genes) or housekeeping genes (i.e. mitochondrial genes, ribosomal genes) showed no change in histone acetylation between OT-II and OT-II HDAC3-cKO thymocytes (Figure 3—figure supplement 5A–B). Altogether, this shows that HDAC3-deficient thymocytes induce CD8-lineage genes and fail to prompt the CD4-lineage program after receiving a TCR signal. Regulation of cell identity occurs at the chromatin level through cis and trans elements, such as enhancers. Super-enhancers are areas of the genome that control genes important for cell type specification (Hnisz et al., 2013; Whyte et al., 2013). Therefore, alterations in super-enhancers may play a role in the re-direction of MHC class II-restricted cells to the CD8-lineage in HDAC3-deficient cells. Very high levels of H3K27ac reliably characterize super-enhancers (Hnisz et al., 2013). Therefore, the H3K27ac ChIP-seq dataset was used to identify super-enhancers in Immature (DP) cells from OT-II and OT-II HDAC3-cKO mice to determine whether prior to receiving a TCR signal, HDAC3-deficient DP thymocytes show a CD8-lineage bias. Using the ROSE (Rank Ordering of Super-Enhancers) algorithm to identify super-enhancers (Whyte et al., 2013; Lovén et al., 2013) within the Immature (DP) compartment, 5967 typical-enhancers were identified from OT-II mice and 7496 typical enhancers from OT-II HDAC3-cKO mice, while 263 super-enhancers were identified from OT-II mice and 360 super-enhancers from OT-II HDAC3-cKO mice (Figure 4A), demonstrating that deletion of HDAC3 leads to an increase in the number of enhancers. Further examination revealed a significant increase in H3K27ac signal at super-enhancers from HDAC3-deficient cells compared to WT (Figure 4B–C), while the average H3K27ac signal at typical enhancers remained largely unchanged (Figure 4B). Not only was the H3K27ac signal increased at super enhancers in HDAC3-cKO cells but the median length was also increased compared to the OT-II mice (Figure 4D). 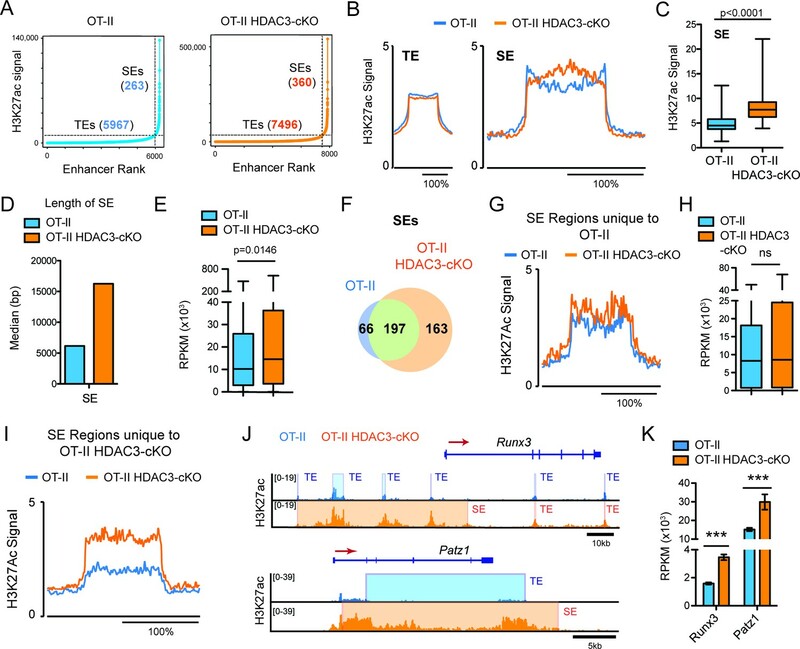 In addition, the increase in acetylation at super-enhancers from OT-II HDAC3-cKO mice corresponded to an increase in gene expression of genes associated with super-enhancers, compared to OT-II mice (Figure 4E). To determine whether the increase in super-enhancer number in HDAC3-deficient Immature (DP) cells was due to the acquisition of new super-enhancers, the number of overlapping super-enhancers between OT-II and OT-II HDAC3-cKO mice was examined. 197 super-enhancers overlapped between the two mice, 66 super-enhancers were unique to OT-II mice, and 163 super-enhancers were unique to OT-II HDAC3-cKO mice (Figure 4F). Upon further examination of the 66 unique super-enhancers from OT-II mice, the level of H3K27ac at these regions was comparable between OT-II and OT-II HDAC3-cKO mice (Figure 4G), as well as the expression of genes associated with those super enhancers (Figure 4H). The H3K27ac signal SE cutoff for OT-II mice was lower than the SE cutoff for OT-II HDAC3-cKO mice (~10,000 versus~35,000, respectively), suggesting that the ‘unique’ super-enhancers in OT-II mice were similarly acetylated between the groups even though they did not reach the threshold for super enhancers in OT-II HDAC3-cKO mice. Alternatively, the unique super-enhancers from OT-II HDAC3-cKO mice exhibited an increase in H3K27 acetylation signal compared to the same regions in OT-II mice (Figure 4I). Among the 163 unique super-enhancers in OT-II HDAC3-cKO mice, super-enhancers near Runx3 and Patz1 (encodes MAZR) were especially notable (Figure 4—source data 1). 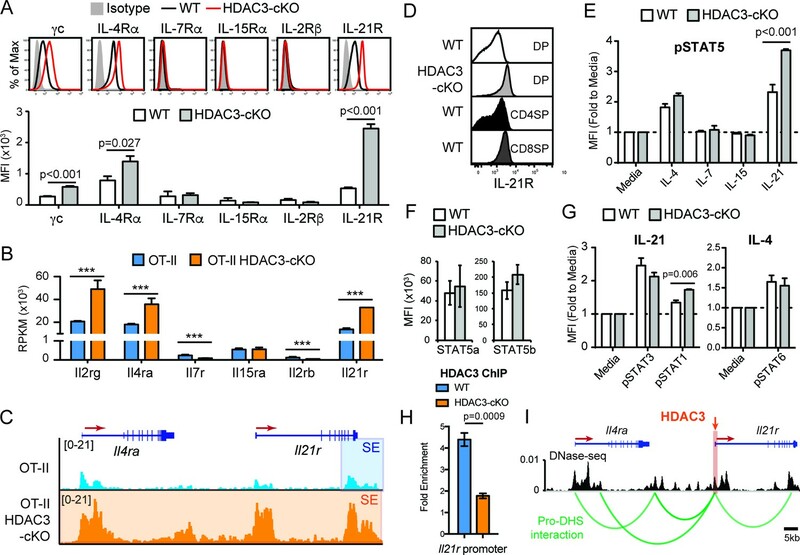 Runx3 and MAZR have been shown to promote CD8-lineage commitment (Sakaguchi et al., 2015; Kohu et al., 2005; Woolf et al., 2003), therefore the formation of Runx3 and Patz1 super-enhancers suggests that HDAC3-deficient DP thymocytes are biased for the CD8-lineage prior to positive selection and lineage choice. Interestingly, the super-enhancer regions near Runx3 from OT-II HDAC3-cKO mice were identified as multiple typical enhancers in OT-II mice (Figure 4J), demonstrating that the lack of HDAC3 leads to an increase in acetylation at enhancer regions near Runx3, stitching of enhancers together, and categorizing the region as a super-enhancer. In fact, this increase in H3K27ac signal corresponds with an increase in mRNA expression (Figure 4K), which is a feature of super-enhancers (Whyte et al., 2013). In sum, deletion of HDAC3 leads to a bias for the CD8-lineage at the Immature (DP) stage by quantitatively increasing CD8-specific enhancer function. DP thymocytes from HDAC3-cKO mice show a CD8-lineage bias at the chromatin level. (A) Typical enhancers (TEs) and super enhancers (SEs) in Immature (DP) cells from OT-II and OT-II HDAC3-cKO mice. (B) Average H3K27ac signal (normalized to input) for TE and SE regions from OT-II and OT-II HDAC3-cKO mice. (C) Box-and-whisker plot of H3K27ac signal for each super enhancer in OT-II and OT-II HDAC3-cKO mice. (D) Median length of super-enhancers between OT-II and OT-II HDAC3-cKO mice. (E) Box-and-whisker plots of mRNA expression (reads per kilobase of exon per million mapped reads, RPKM) from super-enhancer-associated genes from OT-II and OT-II HDAC3-cKO mice. (F) Venn Diagram of shared and unique SEs between OT-II and OT-II HDAC3-cKO mice. (G) H3K27ac signal at super-enhancer regions unique to OT-II mice and the corresponding regions in OT-II HDAC3-cKO mice. (H) Box-and-whisker plots of mRNA expression (RPKM) between OT-II and OT-II HDAC3-cKO mice of genes associated with super-enhancers unique to OT-II mice. (I) H3K27ac signal at super-enhancer regions unique to OT-II HDAC3-cKO mice and the corresponding regions in OT-II mice. (J) Snapshot of H3K27ac ChIP-seq tracks at the Runx3 and Patz1 locus from OT-II (blue) and OT-II HDAC3-cKO (orange) mice. Shaded regions depict TEs and SEs. (K) Gene expression (RNA-seq) of Runx3 and Patz1 in Immature (DP) cells from OT-II and OT-II HDAC3-cKO mice. (B, G, I) The x-axis represents a surrounding area that corresponds to 200% of the center of each region. (***, p < 0.001). See also Figure 4—source data 1. Common gamma chain cytokine signaling drives CD8-lineage commitment under normal conditions (Park et al., 2010). Since pre-selection thymocytes show a transcriptomic and chromatin bias for the CD8-lineage when HDAC3 is absent, cytokine signaling may also be altered in HDAC3-deficient DP thymocytes. Therefore, the expression of common gamma chain receptors were examined in DP thymocytes between WT and HDAC3-cKO mice. In WT mice, DP thymocytes did not express IL-7Rα, IL-15Rα, and IL-2Rβ, and expressed common gamma chain (γc), IL-4Rα, and IL-21R at low levels compared to isotype control (Figure 5A). Similarly, DP thymocytes from HDAC3-cKO mice did not express IL-7Rα, IL-15Rα, and IL-2Rβ (Figure 5A), however common gamma chain (γc), IL-4Rα, and IL-21R expression were significantly increased compared to WT mice (Figure 5A). Likewise, DP thymocytes from OT-II RB3 mice exhibited a significant increase in IL-21R expression compared to DP thymocytes from OT-II, OT-I, and OT-II RB mice (Figure 5—figure supplement 1A). In addition, mRNA levels of Il2rg, Il4ra, and Il21r were higher in OT-II HDAC3-deficient DP thymocytes compared to OT-II DP thymocytes (Figure 5B). Furthermore, the Il4ra and Il21r gene loci were hyperacetylated in OT-II HDAC3-deficient DP thymocytes compared to OT-II DP thymocytes (Figure 5C). Overall, there is a clear up-regulation of select common gamma chain receptors in HDAC3-deficient cells, and, interestingly, the elevated levels of IL-21R observed on DP thymocytes from HDAC3-cKO mice were comparable to IL-21R expression on CD8SP thymocytes from WT mice (Figure 5D), suggesting that deletion of HDAC3 leads to a pre-mature upregulation of IL-21R on DP thymocytes. DP thymocytes from HDAC3-cKO mice show increased STAT5 activation in response to IL-21. (A) Surface expression of cytokine receptor chains γc, IL-4Rα, IL-7Rα, IL-15Rα, IL-2Rβ, and IL-21R on DP thymocytes from WT and HDAC3-cKO mice. Flow cytometric plots have an isotype control to illustrate background level of expression. (B) Gene expression (RNA-seq) of Il2rg, Il4ra, Il7r, Il15ra, Il2rb, and Il21r in Immature (DP) cells from OT-II and OT-II HDAC3-cKO mice. (C) Snapshot of H3K27ac ChIP-seq tracks at the Il4ra and Il21r gene loci in Immature (DP) thymocytes from OT-II and OT-II HDAC3-cKO mice. Shaded regions identify super-enhancers. (D) Protein expression of IL-21R on DP, CD4SP and CD8SP thymocytes from WT mice and DP thymocytes from HDAC3-cKO mice. (E) pSTAT5 levels in DP thymocytes from WT and HDAC3-cKO mice after 10 min ex vivo stimulation with IL-21, IL-15, IL-7, IL4, or media alone. (F) Protein expression of STAT5a and STAT5b in DP thymocytes from WT and HDAC3-cKO mice. (G) pSTAT3 and pSTAT1 levels after a 10 min in vitro IL-21 stimulation, and pSTAT6 levels after IL-4 stimulation of DP thymocytes from WT and HDAC3-cKO mice. (H) Quantitative ChIP (qChIP) of HDAC3 binding at the Il21r promoter in DP thymocytes from WT and HDAC3-cKO mice. Graph depicts fold enrichment over Rpl30 (n = 4 mice/group from four indpendent experiments). (I) DNase-seq and Hi-C arc plots at the Il4ra and Il21r gene loci in DP thymocytes and pooled DN3-to-DP thymocytes, respectively. Shaded region highlights where HDAC3 binds, as shown in Figure 5H. (DHS, DNA hypersensitivity sites). (A, E, G) Bar graph shows mean ± SEM of MFI from 4 to 5 mice from at least three independent experiments. (D, H) Plots are representative of at least three mice from three independent experiments. (F) Bar graph shows mean ± SEM of MFI from three mice from two independent experiments. (***, p < 0.001). See also Figure 5—figure supplements 1–2. Typically, WT DP thymocytes are resistant to STAT5 activation due to low cytokine receptor expression and high SOCS1 expression (Yu et al., 2006). However, IL-4 and IL-21 receptor expression was markedly increased in HDAC3-cKO mice. To determine whether stimulation by IL-4 or IL-21, as well as other common gamma chain-containing receptors, leads to STAT5 activation in DP thymocytes, STAT5 phosphorylation (p-STAT5) was measured after stimulation with IL-4, IL-7, IL-15, or IL-21. There was no change in p-STAT5 levels after IL-7 or IL-15 stimulation of thymocytes from WT or HDAC3-cKO mice, as expected since DP thymocytes lack IL-7R and IL-15R expression (Figure 5E). Alternatively, IL-21 stimulation led to a significant increase in p-STAT5 in HDAC3-deficient thymocytes, with about a 2-fold increase over WT cells and a 4-fold increase over no stimulation (Figure 5E). Similarly, DP thymocytes from OT-II RB3 mice exhibited a significant increase in p-STAT5 after IL-21 stimulation compared to DP thymocytes from OT-II, OT-I, and OT-II RB mice (Figure 5—figure supplement 1B). This increase in p-STAT5 in HDAC3-deficient thymocytes was not due to a change in total STAT5a or STAT5b levels (Figure 5F). To determine whether the increased IL-21R expression in HDAC3-deficient DP thymocytes also leads to enhanced activation of STAT3 and STAT1, p-STAT3 and p-STAT1 levels were measured after IL-21 stimulation. There was no change in p-STAT3 levels between WT and HDAC3-cKO mice after IL-21 stimulation, while p-STAT1 levels showed a slight increase in HDAC3-cKO mice compared to WT mice (Figure 5G). Similarly, there was no change in p-STAT6 levels between WT and HDAC3-cKO mice after IL-4 stimulation (Figure 5G). Therefore, in DP thymocytes from HDAC3-cKO mice, STAT5 activation was enhanced in response to IL-21 stimulation. To determine whether IL-21R expression and signaling occurs prior to the DP stage in HDAC3-cKO mice, we examined IL-21R expression and pSTAT5 signaling in DN and immature SP (ISP; CD8+CD4-TCRβ-) thymocytes from WT and HDAC3-cKO mice. IL-21R expression was similar in DN thymocytes between mice, however ISPs from HDAC3-cKO mice exhibited a significant increase in IL-21R expression compared to WT mice (Figure 5—figure supplement 2A). Of note, the level of IL-21R expression in ISPs from HDAC3-cKO mice was less than what was observed in DP thymocytes (Figure 5—figure supplement 2A). In addition, upon IL-21 stimulation, ISPs from HDAC3-cKO mice exhibited a significant increase in phospho-STAT5 levels compare to WT mice, while stimulation with IL-4, IL-7, and IL-15 showed no effect (Figure 5—figure supplement 2B). Therefore, IL-21R expression and signaling precedes the DP stage. A major function of HDAC3 is to repress gene expression. To determine whether HDAC3 associates with the Il21r gene locus in DP thymocytes to regulate IL-21R expression, HDAC3 binding was measured by quantitative ChIP (qChIP). Interestingly, HDAC3 was enriched at the Il21r promoter in DP thymocytes from WT mice compared to HDAC3-cKO mice (Figure 5H), demonstrating that HDAC3 interacts with the Il21r promoter directly. The Il21r gene locus resides next to Il4ra on chromosome 7 in mice. As shown previously, deletion of HDAC3 results in elevated histone acetylation at both IL21r and Il4ra gene loci (Figure 5C). Interestingly, the increase in acetylation in HDAC3-deficient cells resulted in a dramatic expansion of a super-enhancer detected near the transcription end site of Il21r in OT-II cells (Figure 5C), suggesting regulation of Il21r and Il4ra may be coordinated. Publicly available DNase-seq and Hi-C of WT DP thymocytes were examined for chromatin looping between regulatory elements and gene promoters within the Il21r and Il4ra gene loci (dataset from Hu et al., 2018). Remarkably, the Il21r promoter looped with multiple regulatory elements (DNase-seq peaks) at the Il4ra gene locus (Figure 5I), suggesting these genes are co-regulated. Since HDAC3 associates with the Il21r promoter, which interacts with the Il4ra locus through chromatin looping, HDAC3 may also function to reduce histone acetylation at Il4ra. Altogether, HDAC3 is required to reduce expression of the IL-21R and IL-4R cytokine receptors in DP thymocytes. HDAC3 is required to restrain cytokine signaling in DP thymocytes. Since cytokine signaling drives CD8-lineage commitment and HDAC3-deficient thymocytes exhibit accelerated commitment to the CD8-lineage, elevated IL-21R signaling may promote the redirection of MHC class II-restricted thymocytes to the CD8-lineage when HDAC3 is absent. To test this, OT-II and OT-II RB3 mice were treated with an anti-IL-21R blocking antibody and assessed for CD4-lineage commitment. After two weeks of antibody injections, the CD4/CD8 profile was analyzed within the mature SP thymocyte compartment. As expected, isotype and anti-IL-21R antibody treated OT-II mice produced CD4SP thymocytes (Figure 6A). However, blocking IL-21R signaling in OT-II RB3 mice did not restore CD4-lineage commitment, as both isotype and anti-IL-21R antibody treatments produced CD8SP thymocytes in OT-II RB3 mice (Figure 6A). To determine whether blocking IL-21R signaling altered ThPOK or Runx3 expression early in CD4/CD8-lineage choice, OT-II and OT-II RB3 mice were examined for expression of these transcription factors in Vβ5intH2Kneg thymocytes (see Figure 6—figure supplement 1 for gating). As expected, there was similar ThPOK expression early in CD4/CD8-lineage choice between isotype and anti-IL-21R antibody-treated OT-II mice (Figure 6B). However, OT-II RB3 mice treated with an anti-IL-21R blocking antibody failed to induce ThPOK (Figure 6B). In addition, Runx3 expression was still induced early in lineage choice in both isotype and anti-IL-21R blocking antibody treated OT-II RB3 mice (Figure 6C). Therefore, blocking IL-21R signaling in HDAC3-deficient thymocytes is not sufficient to correct for the redirection of MHC class II-restricted thymocytes to the CD8-lineage. Blocking IL-21R does not restore CD4-lineage commitment in OT-II RB3 mice. (A) OT-II and OT-II RB3 mice were injected with isotype or anti-IL-21R blocking antibodies retro-orbitally (i.v.) for two weeks every 3–4 days. Flow plots depict CD4/CD8 profile in mature SP thymocytes (Vβ5+Vα2+H2K+CD24lo). Data is representative of 3–4 mice per group from two independent experiments. (B–C) ThPOK (B) and Runx3 (C) expression in Vβ5hiH2K- thymocytes from OT-II and OT-II RB3 mice treated with isotype or anti-IL-21R blocking antibody, as performed in A. Data show mean ± SEM of geometric MFI from 3 to 4 mice from two independent experiments. See also Figure 6—figure supplement 1. Since blocking IL-21R signaling could not alter the aberrant lineage commitment in HDAC3-deficient thymocytes, HDAC3 may function to repress the expression of CD8-lineage genes directly. To understand the mechanisms of HDAC3-mediated Runx3 and Patz1 gene regulation, HDAC3 binding was measured at the Runx3 and Patz1 gene loci in DP thymocytes. Since HDAC3 deletion results in the formation of super enhancers near Runx3 and Patz1 prior to positive selection (Figure 4J), HDAC3 may associate with these regions to regulate histone acetylation. Candidate HDAC3 binding sites were determined from examination of publicly available HDAC3 ChIP-seq datasets (Nanou et al., 2017; Wang et al., 2009). Datasets from pro-B cells and human CD4 T cells revealed HDAC3 binding at a region 50 kb upstream of Runx3, the Runx3 promoter, and within exon 1 of Patz1 (Figure 7—figure supplement 1). In particular, these binding sites correspond with areas where super enhancers form in HDAC3-deficient DP thymocytes (Figure 7—figure supplement 1). Likewise, in DP thymocytes, HDAC3 bound to the region 50 kb upstream of Runx3 and exon 1 of Patz1, however HDAC3 did not bind to the Runx3 promoter (Figure 7A). Since the HDAC3 binding site is 50 kb upstream of Runx3, the DNA-seq and Hi-C datasets were revisited to examine for chromatin looping and whether HDAC3 interacts with the Runx3 gene locus in DP thymocytes (Hu et al., 2018). In fact, the Runx3 promoter associated with four regulatory elements upstream, including one near where HDAC3 binds (Figure 7B). Therefore, HDAC3 binds to regulatory elements associated with Runx3 and Patz1, suggesting that HDAC3 has a direct regulatory role in repressing CD8-lineage promoting genes in DP thymocytes. HDAC3 binds to Runx3 and Patz1 regulatory regions in DP and CD4SP thymocytes. (A) HDAC3 qChIP in DP thymocytes from WT and HDAC3-cKO mice. Plots show mean ± SEM of fold enrichment over Rpl30 (n = 3 mice/group from three independent experiments). (B) DNase-seq and Hi-C arc plots at the Runx3 and Patz1 gene loci in DP thymocytes and pooled DN3-to-DP thymocytes, respectively. Shaded region highlights where HDAC3 binds, as shown in (A). (DHS, DNA hypersensitivity sites). (C) HDAC3 protein expression measured by flow cytometry in DP, CD4+CD8lo, CD4SP, and CD8SP thymocytes from WT mice. Plots show mean ± SEM of fold enrichment over isotype (n = 4 mice/group from three independent experiments). (D) HDAC3 qChIP in SP thymocytes from OT-II and OT-I mice. Plots show mean ± SEM of fold enrichment over Rpl30 (n = 4 mice/group from two independent experiments). See also Figure 7—figure supplements 1–2. Since HDAC3 is required to repress Runx3 and Patz1 expression in DP thymocytes, HDAC3 may also regulate Runx3 and Patz1 expression differently between CD4SP and CD8SP thymocytes. First, HDAC3 protein expression was measured during T cell development by flow cytometry to determine whether HDAC3 protein is regulated differently during lineage choice. Interestingly, HDAC3 protein expression was significantly reduced in CD8SP thymocytes compared to DP, CD4+CD8lo, and CD4SP thymocytes (Figure 7C). In fact, HDAC3 qChIP revealed that HDAC3 binding to Runx3 and Patz1 regions was lost in CD8SP thymocytes and maintained in CD4SP thymocytes (Figure 7D). This suggests a direct regulatory role of HDAC3 to repress Runx3 and Patz1 in DP and CD4SP thymocytes and removal of HDAC3 from Runx3 and Patz1 loci is important for CD8-lineage commitment. The ability to undergo error-free CD4/CD8-lineage choice is critical for maintaining the adaptive immune system. Here, we demonstrate that the histone deacetylase HDAC3 is required for CD4-lineage commitment. Two mouse models were used to study this, OT-II RB3 mice and OT-II HDAC3-cKO mice. OT-II RB3 mice, the mouse model that bypassed the positive selection defect in HDAC3-cKO mice, exhibited redirection of MHC class II-restricted cells to the CD8-lineage and accelerated kinetics towards CD8-lineage commitment. OT-II HDAC3-cKO mice, which have a block in positive selection, revealed Immature (DP) thymocytes to be biased for the CD8-lineage prior to positive selection and Selecting (CD69+) cells failed to initiate the CD4-lineage program. We determined that HDAC3 binds to the Il21r promoter and is required to control IL-21R expression and STAT5 activation in DP thymocytes, however blocking IL-21R signaling did not restore CD4-lineage commitment in OT-II RB3 mice. Rather, HDAC3 binds to the CD8-lineage promoting genes Runx3 and Patz1 to restrain CD8-lineage genes for CD4-lineage commitment. Regulation of cytokine signaling is critical for proper T cell development. In particular, cytokine signaling is restrained in DP thymocytes and drives CD8-lineage commitment after positive selection. 75% of MHC class I-restricted thymocytes undergo CD8-lineage commitment via γc cytokine receptor signaling, primarily through IL-7 (McCaughtry et al., 2012; Etzensperger et al., 2017). IL-7R signaling is shut off in DP thymocytes, as enforced IL-7R signaling results in the CD8-lineage fate (Park et al., 2010). Whether overexpression of STAT5-inducing cytokine receptors in DP cells other than IL-7R can induce CD8-lineage commitment was unknown. Here, we show that HDAC3 deletion leads to increased IL-21R expression in DP thymocytes. IL-21 is secreted by thymic epithelial cells, therefore overactive IL-21R signaling in DP thymocytes may promote CD8-lineage commitment. However, blocking IL-21R signaling did not restore CD4-lineage choice in HDAC3-deficient thymocytes. Thymocytes navigate through distinct steps to undergo error-free lineage choice. Recently, Kimura et al identified two phases of lineage commitment in MHC class I-restricted thymocytes—phase one identifies cells testing for TCR signal persistence, and phase two classifies cells receiving cytokine signaling that results in CD8-lineage commitment (Kimura et al., 2016). Expression of ThPOK and Runx3 corresponds with these two phases, as ThPOK is induced in phase 1and Runx3 in phase 2 (Kimura et al., 2016). Cytokine signaling is confined to phase 2 and drives Runx3 expression, as SOCS1 transgenic OT-I mice failed to induce Runx3 expression in phase 2 (Kimura et al., 2016). However, this study focused on MHC class I-restricted cells. In our study, we found that MHC class II-restricted thymocytes erroneously committed to the CD8-lineage. Using the same gating scheme to distinguish the two phases of lineage commitment, Runx3 was expressed pre-maturely in phase 1 in OT-II RB3 mice. Correspondingly, ThPOK was not induced in OT-II RB3 mice, suggesting that a true ‘phase 1’ may not have occurred and commitment to the CD8-lineage was accelerated. Consistent with this, CD8α was not downregulated in OT-II RB3 mice at phase 1. We show an epigenetic mechanism where HDAC3 is required to restrain Runx3 expression in DP thymocytes to maintain a bipotential state. In DP thymocytes, HDAC3 binds to a regulatory element upstream of Runx3, and deletion of HDAC3 results in hyperacetylation at this locus, as well as an increase in Runx3 mRNA levels. Therefore, HDAC3 functions to restrain CD8-lineage promoting genes for CD4-lineage development. 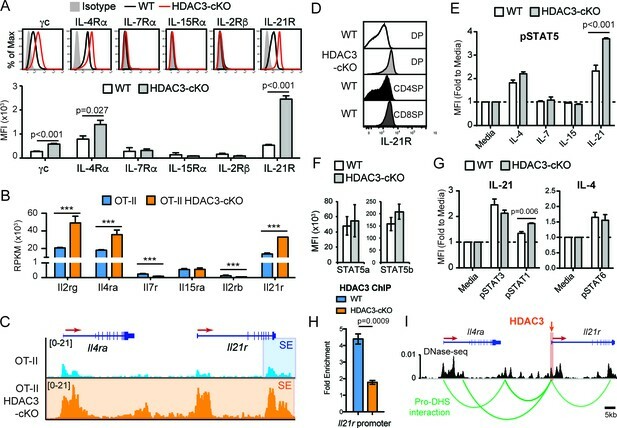 While class I HDACs play a role in regulating CD4/CD8-lineage identity, our study identifies a distinct role for HDAC3 to prevent redirection of MHC class II-restricted cells to the CD8-lineage. 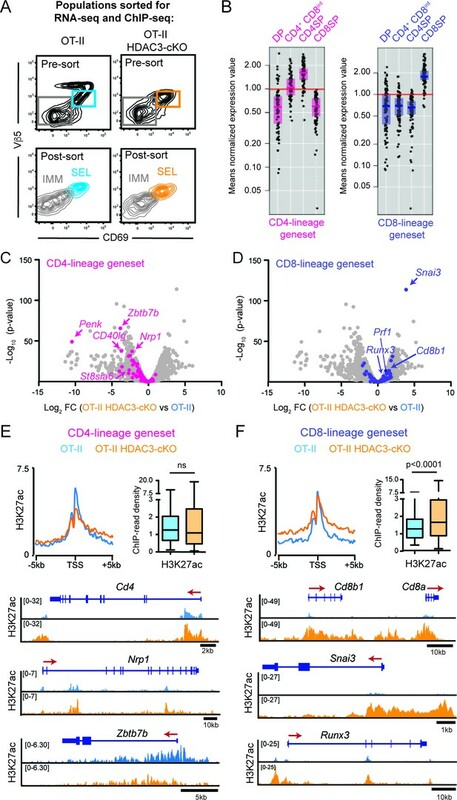 Combined deletion of HDAC1 and HDAC2 via CD4-cre results in loss of CD4-lineage integrity, as peripheral CD4 helper T cells aberrantly express the CD8 coreceptor (CD4+CD8+ T cells) as well as the CD8 effector T cell program upon activation (Boucheron et al., 2014a). It appears that CD4/CD8-lineage commitment is unaffected in these mice, but rather HDAC1/2 function to constitutively repress CD8-lineage genes in CD4 T cells in the periphery (Boucheron et al., 2014b). Alternatively, deletion of HDAC3 by CD2-icre results in a transcriptomic and histone acetylation bias for the CD8-lineage prior to positive selection and misdirection of thymocytes to the CD8-lineage. In fact, HDAC3 binds to Runx3 and Patz1 regulatory elements in DP and CD4 SP thymocytes in WT mice. However, CD4-cre mediated deletion of HDAC3 resulted in no defect in CD4/CD8-lineage integrity (Hsu et al., 2015), as HDAC3 protein is still present at the DP stage in these mice (Philips et al., 2016). This demonstrates that HDAC3 is specifically required for restraining CD8-lineage genes is DP thymocytes, however redundant mechanisms in addition to HDAC3 are required for maintenance of CD8-lineage gene repression in CD4SP thymocytes. Compared to HDAC1/2 maintaining CD4-lineage identity in the periphery, HDAC3 functions to limit CD8-lineage genes in DP thymocytes prior to CD4-lineage commitment. Hdac3 fl/fl mice (Knutson et al., 2008) mice were previously described. B6.SJL, Bcl-xL Tg mice (Chao et al., 1995), RORγt-knockout (KO) mice (Ivanov et al., 2006), and CD2-icre mice (Zhumabekov et al., 1995), OT-II mice (Barnden et al., 1998), and OT-I mice (Hogquist et al., 1994) were purchased from The Jackson Laboratory. Mice were housed in barrier facilities and experiments were performed at the Mayo Clinic with the approval of the Institutional Animal Care and Use Committee. All mice were analyzed between the ages of 3 and 12 weeks. All genetically modified mice were examined with either littermate or age-matched controls, which may include floxed-only mice (no Cre), CD2-icre, RORγt-het, or WT mice, as no differences were observed between these mice. For convenience, the control mice in each experiment are termed wild-type (WT) but may represent either floxed-only, CD2-icre, RORγt-het or WT mice. No difference was observed between male and female mice. Mouse genotypes were confirmed by flow cytometry and/or by PCR after euthanizing the mouse. Mixed bone marrow chimeras (BMCs) were generated by i.v. injecting 4 × 106 cells from either a 50:50 mix of OT-II (CD45.1−/−)/B6.SJL (CD45.1+/+) or OT-II RB3 (CD45.1−/−)/B6.SJL (CD45.1+/+) mice into lethally irradiated congenic B6.SJL (CD45.1+/+) recipients. In experiments where OT-II RB3 straight chimeras were used, 4 × 106 bone marrow cells from OT-II and OT-II RB3 mice were i.v. injected into lethally irradiated congenic B6.SJL (CD45.1+/+) or β2m-KO (CD45.1−/−) recipients. Antibodies recognizing the OT-II TCR transgene (Vβ5+Vα2+) were used to exclude the contribution of hematopoietic cells from CD45.1− β2m-KO recipients. Recipient mice from mixed BMCs or straight chimeras received the antibiotic enrofloxacin in their drinking water for 3 weeks and were analyzed after 8 weeks. FACS analysis was performed on an Attune NxT flow cytometer (Thermo Fisher), and all experiments were analyzed using FlowJo software (v9.5). Cytoplasmic and nuclear proteins were examined via intracellular flow cytometry. Thymocytes or splenic lymphocytes were labeled with surface markers before being fixed and permeabilized with a Foxp3/Transcription Factor Staining Buffer Set (for nuclear protein staining; eBioscience or Tonbo Biosciences), True-Nuclear Transcription Factor Buffer Set (for SOCS1 or SOCS3 staining; Biolegend) or an intracellular fixation and permeabilization buffer kit (for cytoplasmic protein staining; BD Biosciences). All analyses included size exclusion (forward scatter [FSC] area/side scatter [SSC] area), doublet exclusion (FSC height/FSC area), and dead cell exclusion (fixable viability dye; eBioscience or Tonbo Biosciences). All other reagents for flow cytometry were purchased from BD Biosciences, eBioscience, BioLegend, Tonbo Biosciences, Cell Signaling, or Abcam. Unless stated in other Materials and methods section, the following clones for flow cytometry were used: CD4 (clone RM4-5), CD8α (clone 53–6.7), TCR Vβ5.1/5.2 (clone MR9-4), TCR Vα2 (clone B20.1), Runx3 (clone R3-5G4), ThPOK (clone T43-94), Granzyme B (clone NGZB), CD24 (clone M1/69), H-2Kb (clone AF6-88.5), CCR7 (clone 4B12), CD132 (common γ chain) (clone TUGm2), IL-4Rα (clone I015F8), IL-7Rα (clone A7R34), IL-15Rα (clone DNT15Ra), CD122 (IL-2Rβ) (clone 5H4), IL-21R (clone 4A9), ROR gamma (t) (clone B2D), Bcl-xl (clone 7B2.5), CD45.2 (clone 104), HDAC3 (ab7030). To examine phosphorylation of STAT proteins, total thymocytes were stimulated with 20 ng/mL of IL-4, 10 ng/mL of IL-7, 10 ng/mL of IL-15, or 10 ng/mL of IL-21 or left unstimulated for 10 min in complete culture media (RPMI 1640 with 10% FCS, L-glutamine, penicillin, and streptomycin). After stimulation, cells were immediately fixed with BD Lyse/Fix Buffer (BD Phosflow kit), stained for surface proteins, permeabolized with BD Perm Buffer III (BD Phosflow kit), and stained with antibodies targeting pSTAT5 (#9365, Cell Signaling Technology), pSTAT1 (#8009, Cell Signaling Technology), pSTAT3 (#4324, Cell Signaling Technology), or pSTAT6 (#9361, Cell Signaling Technology) for 30 min at room temperature. Secondary antibody (#4414, Cell Signaling Technology) was used for pSTAT6 and stained for 10 min on ice. To examine Granzyme b and Perforin after stimulation, total thymocytes were left unstimulated or stimulated with plate bound 5 μg/mL of anti-TCRβ (H57-597; BioXCell) and 5 μg/mL of soluble anti-CD2 (RM2-5; eBioscience). After two days of culture, cells were harvested and stained for flow cytometry. Cell sorting for ChIP-seq and RNA-seq was performed on the BD FACS Aria (BD Biosciences). Total thymocytes were stained with CD4 (RM4-5), CD8α (53–6.7), Vβ5 (B21.5), CD69 (H1.2F3), and DAPI. Immature thymocytes were gated as Live Vβ5lo CD69- CD4+ CD8α+. Selecting thymocytes were gated as Live Vβ5int CD69+. Post-sorting analysis was performed to verify purity. For RNA-seq, individual samples were sorted and used in biological triplicate. For ChIP-seq, individual samples were sorted, pooled from 4 OT-II mice or 6 OT-II HDAC3-cKO mice, and then separated into equal samples for IP (see ChIP-seq for details). RNA was extracted from FACS sorted cells with Qiazol (Qiagen) and purified using the RNeasy Micro kit (Qiagen) using DNase treatment, according to the manufacturer’s protocol. 200 ng of total RNA was used to make libraries using Illumina TruSeq RNA Library Preparation Kit v2 (Illumina) according to the manufacturer’s protocol. RNA-seq libraries were sequenced on the Illumina HiSeq 4000 platform at Medical Genome Facility at Mayo Clinic. Gene expression analysis was performed using the Mayo RNA-sequencing analysis pipeline, MAP-RSeq (Kalari et al., 2014). Briefly, FASTQ reads (paired-end; 100 bp) were aligned to mm10 using TopHat2 (Trapnell et al., 2009), raw gene and exon counts are generated by featureCounts (Liao et al., 2014), and the quality of samples was determined using RSeQC (Wang et al., 2012). edgeR v3.8.6 (Robinson et al., 2010) was used to perform the differential expression analysis comparing the several groups among each other. Genes which had a False discovery rate (FDR) < 0.05 and an absolute log2Fold Change > 1.5 were considered to be significantly differentially expressed. ChIP-seq was performed as previously described (Zhong et al., 2017). Sorted cells were cross-linked with 1% formaldehyde (final concentration) for 10 min and quenched with 125 mM glycine for 5 min at room temperature. After washing with TBS, cells were resuspended in cell lysis buffer (10 mM Tris-HCl, pH7.5, 10 mM NaCl, 0.5% NP-40) and incubated on ice for 10 min. Lysates were washed with MNase digestion buffer (20 mM Tris-HCl, pH7.5, 15 mM NaCl, 60 mM KCl, 1 mM CaCl2). After resuspension in 200 μL fresh MNase digestion buffer containing a proteinase inhibitor cocktail (Sigma), the lysates were incubated with 2000 units of MNase (NEB, Cat # M0247S) per 4 × 106 cells at 37°C for 20 min with continuous mixing in thermal mixer. After adding 200 μL of sonication buffer (100 mM Tris-HCl, pH8.1, 20 mM EDTA, 200 mM NaCl, 2% Triton X-100, 0.2% sodium deoxycholate), the lysates were sonicated for 30 min (30 s on/30 s off) using Bioruptor Twin (UCD-400) (Diagenode, Inc.) and centrifuged at 21,130 x g for 10 min. The supernatants were collected, and the chromatin content was estimated by the Qubit assay (Invitrogen). For normalization of ChIP efficiency, Drosophila chromatin equivalent to about 5% of total chromatin was added. The chromatin was then incubated with anti-H3K27ac antibody (Abcam, Cat.# ab4729, lot# GR150367) or in-house generated anti-H3K9ac antibody (EDL lot 1) on a rocker overnight. Protein G-magnetic beads (30 μL, Life Technologies) were added, and further incubated for 3 hr. The beads were extensively washed with ChIP buffer (50 mM Tris-HCl, pH8.1, 10 mM EDTA, 100 mM NaCl, 1% Triton X-100, 0.1% sodium deoxycholate), high salt buffer (50 mM Tris-HCl, pH8.1, 10 mM EDTA, 500 mM NaCl, 1% Triton X-100, 0.1% sodium deoxycholate), LiCl2 buffer (10 mM Tris-HCl, pH8.0, 0.25 M LiCl2, 0.5% NP-40, 0.5% sodium deoxycholate, 1 mM EDTA), and TE buffer. Bound chromatin was eluted and reverse-crosslinked at 65°C overnight. DNAs were purified using Min-Elute PCR purification kit (Qiagen) after the treatment of RNase A and proteinase K. ChIP-seq libraries were prepared from about 5 ng ChIP and input DNA using the ThruPLEX DNA-seq Kit V2 (Rubicon Genomics, Ann Arbor, MI). ChIP enrichment was validated in library DNAs by performing real-time PCR (see Supplementary file 1 for primer sequences). The libraries were sequenced to 51 base pairs from both ends on an Illumina HiSeq 2000 instrument in the Mayo Clinic Center for Individualized Medicine Medical Genomics Facility. ChIP-seq data was processed using the HiChIP pipeline (Yan et al., 2014) incorporating ChIP-Rx normalization (Orlando et al., 2014). Briefly, mouse reads were aligned to mm10 using Burrows-Wheeler Aligner (BWA) (Li et al., 2009) and Drosophila reads aligned to dm3 using custom scripts. Picard (http://broadinstitute.github.io/picard/) was used to mark duplicates. Read pairs without a unique alignment were filtered out using SAMTools (Li and Durbin, 2009) and a custom script that only retains pairs with one or both ends uniquely mapped. Mouse reads were normalized to Drosophila reads according to Orlando et al., 2014. Peaks were called using MACS2 (Zhang et al., 2008) for H3K27ac and H3K9ac. The ROSE software package (Whyte et al., 2013; Lovén et al., 2013) was used for typical enhancer and super enhancer analysis. Data was visualized using Integrative Genomics Viewer (IGV) and EaSeq (Lerdrup et al., 2016). Genesets for RNA-seq and ChIP-seq analysis were generated using Immgen.org (Immunological Genome Consortium; Heng et al., 2008). Specifically, we created CD4-lineage and CD8-lineage genesets using the ‘Population Comparison’ program, which performs a comparison of gene expression between different immune populations according to fold change, p-value, and FDR. CD4SP (‘T_4SP24-_Th’) and CD8SP (‘T_8SP24-_Th’) populations were compared using Microarry V1 dataset provided by the software. The CD4-lineage geneset consists of the top 100 genes expressed in the CD4SP population, and the CD8-lineage geneset consists of the top 100 genes expressed in the CD8SP population. To confirm the gene lists corresponded with the appropriate thymic developmental stages, the ‘My GeneSet’ program was used to determine how each geneset is expressed in DP (‘T_DP_Th’), CD4 +CD8 lo (‘T_4 + 8int_Th’), CD4SP (‘T_4SP24-_Th’) and CD8SP (‘T_8SP24-_Th’) populations. The plot generated by ‘My GeneSet’ program was used in Figure 3B. See Figure 3—source data 2 for gene list. For RNA-seq data analysis using CD4-lineage and CD8-lineage gene sets, genes that did not have transcripts were excluded from the gene list. OT-II and OT-II RB3 mice were retro-orbitally (i.v.) injected with 100 μg of isotype (polyclonal Armenian hamster IgG, BioXCell) or anti-IL-21R (4A9, BioXCell) antibody for two weeks every 2–3 days. After the last injection, thymocytes were harvested and processed for flow cytometry. For HDAC3 qChIP, DP thymocytes were enriched using the EasySep Mouse Streptavidin RapidSpheres Isolation kit (#19860, StemCell Technologies) to remove SP and DN thymocytes with biotin-conjugated anti-CCR7 (4B12), anti-IL-7Rα (A7R34), anti-H2K (AF6-88.5), anti-CD44 (IM7), and anti-CD25 (PC61.5) as well as anti-TCRγδ (UC7-13D5) antibodies. For SP thymocyte enrichment, Mouse PE Positive Selection kit (#18554, StemCell Technologies) was used positively select for CCR7+ thymocytes (PE-conjugated anti-CCR7 (4B12)). ChIP was performed according to Pchelintsev et al. (2016), with the following adjustments: After cell lysis and brief sonication (four mins, 30 s on/30 s off; Bioruptor Pico (Diagenode, Inc.)), equal volume of 2x MNase buffer (35 mM Tris-HCl pH 7.5, 25 mM NaCl, 120 mM KCl, 2 mM CaCl2) was added to each sonication sample along with 3.75 U/μl of MNase (Cell Signaling Technologies #10011S) at 37°C for 15 mins. Anti-HDAC3 antibody (#85057, Cell Signaling Technologies) was used to isolate chromatin bound to HDAC3 after chromatin fragment size was confirmed to be less than 500 bp by gel electrophoresis. Isolated DNA was used to perform real-time PCR. Graphs depict fold enrichment over regions without HDAC3 binding (Rpl30 primers, Cell Signaling Technologies (#7015)). See Supplementary file 1 for primer sequences. To compare between groups, unpaired student t test was used to compare frequency of mature SP thymocytes, Granzyme b/Perforin expression, H3K27ac signal at super-enhancer regions, mRNA levels of gene associated with super-enhancers, cytokine receptor protein expression, and HDAC3 binding via qChIP. The exactTest (edgeR software) was used to compare mRNA levels (RPKM) at individual genes. Student t test was calculated using Microsoft Excel or GraphPad Prism. In house generated ChIP-seq and RNA-seq were deposited to GEO with accession number GSE109531. Publicly available datasets were retrieved from GEO series: GSM2195840 (thymus DNase-seq; mm10), GSM2096648 (pro-B cell HDAC3 ChIP-seq; mm10), GSM393952 (human CD4 T cell HDAC3 ChIP-seq; hg18), GSE79422 (pooled DN3-to-DP Hi-C and associated DNase-seq; mm9). ChIP-seq and DNase-seq datasets were visualized by IGV (mm9). The Hi-C dataset was visualized with the online WashU epigenome browser session (mm9) at http://epigenomegateway.wustl.edu/browser/?genome=mm9&session=bxT0F5m0YY, provided by Hu et al. (2018). Journal of Experimental Medicine 182:821–828. The Journal of Immunology 195:1578–1590. The Journal of Immunology 174:2627–2636. The Journal of Experimental Medicine 209:2263–2276. Journal of Clinical Investigation 118:3588–3597. The Journal of Immunology 197:541–554. Molecular and Cellular Biology 35:3854–3865. Journal of Clinical Investigation 123:3112–3123. Journal of Clinical Investigation 125:1111–1123. The Journal of Immunology 179:4405–4414. The Journal of Experimental Medicine 203:165–175. Journal of Immunological Methods 185:133–140. Thank you for submitting your article "HDAC3 restrains cytokine signaling in CD4+CD8+ thymocytes for the generation of CD4 T cells" for consideration by eLife. Your article has been reviewed by three peer reviewers, one of whom is a member of our Board of Reviewing Editors, and the evaluation has been overseen by Tadatsugu Taniguchi as the Senior Editor. The reviewers have opted to remain anonymous. The reviewers have discussed the reviews with one another and the Reviewing Editor has drafted this decision to help you prepare a revised submission. As you will note, there are substantial issues to be addressed and we like to know whether you will be able to submit the revised version within two months. At this point, we request that you respond with a detailed plan of action and a time table for the completion of this work. The editor will then consider your responses, possibly in consultation with the reviewers, and get back to you with advice. Philips et al. explore the role of HDAC3 in CD4/CD8 lineage commitment and show that HDAC3 loss causes a striking redirection of MHC class II-restricted TCR-transgenic DP thymocytes to the CD8 fate. HDAC3-deficient mice have defects in intrathymic selection, previously studied by these workers. In this work, the authors correct for defects in RORγT down-regulation using mice deficient for RORγT and correct for the survival defect resulting from RORγT deficiency by introducing a transgene for Bcl-xl. Such mice were previously shown to produce only CD8 but not CD4 cells, although subsequent investigation in the manuscript largely use a simpler OT-II TCR-transgenic HDAC3-deficient model, and thymocytes that initiate TCR signaling are isolated and studied. The authors attempt to unravel the molecular basis for this highly penetrant CD4/CD8 cell fate phenotype, revealing changes in the expression of cytokine receptors and in responsiveness to cytokine signaling. They find that HDAC3 deficiency leads to increased H3K27Ac deposition specifically on genes associated with the CD8 lineage, including Runx3, which is critical for commitment to the CD8 lineage. Surprisingly, enhanced Runx3 expression is shown to be secondary to IL-21 signaling. Finally, the authors use an antibody blocking strategy to demonstrate the IL-21R signaling is responsible for changes in acetylation and STAT5 binding the Runx3 locus in HDAC3-deficient mice, since antibody blockade of IL-21R reverses the changes in H3K27Ac, including the increased H3K27Ac at the Il21r locus. 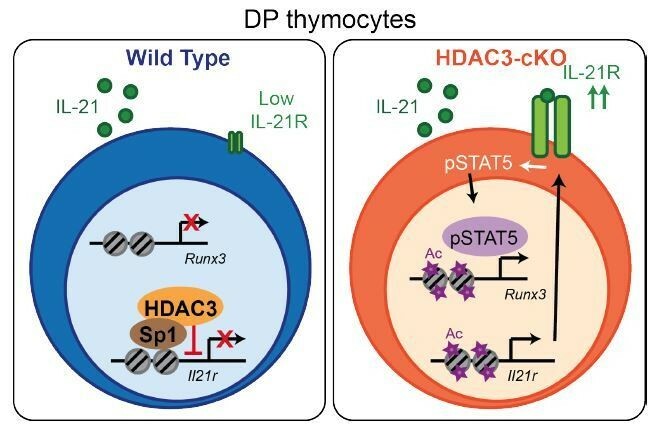 It is thus concluded that HDAC3-deficiency regulates lineage commitment through effects on cytokine signaling, mostly likely Il21r; specifically, that HDAC3 is critical to restrain cytokine signaling in thymocytes, and in its absence IL-21 signaling leads to STAT5 activation, and so CD8 lineage commitment. While the manuscript by Philips et al. show data supporting an interesting role for HDAC3 in regulating the genomic preparedness for thymocyte lineage differentiation into the CD4 branch, the data do not yet quite provide for the visualisation of a robust mechanistic pathway, and there are a number of more formal concerns as well. If these limitations are addressed substantively, it would increase enthusiasm for publication in eLife. 1) How HDAC3 restrains IL-21R cytokine signaling remains unresolved. Also, does IL-21R expression and signaling precede the immature-DP super-enhancer alterations? Does the role of IL-21R in regulating genome-wide acetylation patterns indicate that acetylation is not driven directly by HDAC3? And instead, that HDAC3 has a limited role, for this function, in regulating IL-21R expression and/or signaling alone? The mechanistic model appears to be HDAC3-IL-21R-STAT5-PIAS. Is PIAS in fact essential for this specific functional role of HDAC3? Evidence for these mechanistic steps in mediating the final functional outcome of lineage choice would be very useful. A cartoon of the mechanistic pathways involved would also be very helpful. 2) Another serious omission is that the authors do not appear to address whether blockage of IL-21R blocks CD8 development in OTII-RB3 mice. While authors have demonstrated some effects of HDAC3 loss on cytokine signaling, they have not definitively demonstrated that this is the cause of altered lineage fate, as they have made no attempt to normalize cytokine signaling in HDAC3 mice and link this to restoration of CD4 lineage commitment. If the effect of HDAC3 on IL-21R expression and responsiveness is thought to play a key role, then it should be possible to extend the IL-21R blockade and examine effects on lineage commitment. 3) The functional role of HDAC3 is revealed primarily in RORγT-null Bcl-xl-transgenic mice. While the argument for this complex genotypic background is reasonable, it leaves open an uncertainty about the role of HDAC3 in wild-type double-positive (DP) thymocyte differentiation. Even limited functional data supporting such a role in functional assays in closer-to-wild-type mice would be useful. 4) The lack of inclusion of a Rag1/2-null genotype in the OT-II experiments (Figure 1) leaves the formal possibility open that endogenous MHC class I-restricted TCRs have provided positive selection into the CD8 lineage. Data to rule out such a possibility would be helpful. 5) The ChIP-seq and RNA-seq data in Figure 2 have been done on background genotypes (OT-II and OT-II+HDCA3-null) that are different from the ones used in Figure 1. It would be useful to provide data showing convergence between these various background genotypes. 6) In a number of instances, comparisons are offered between OT-II and OT-II-RB3 mice. It would be advisable to include OT-II-RB genotypes in these comparisons, to ensure formally that the major genotypic distinction is indeed in HDAC3. The reviewers had discussed the reviews with one another and the Reviewing Editor had drafted a letter to express our concerns and elicit a response to the reservations we had about this work. At that point, you will recollect that we sent you that letter and requested that you respond with a detailed plan of action and a time table for the completion of this work. We thank you for your response to that request. The editor and reviewers have now discussed your proposed plans and consider them satisfactory. However, the eLife editorial policy is that manuscripts are to be rejected if revisions are expected to take more than two months. Therefore, while this is a formal rejection, you are strongly encouraged to submit the manuscript again as a new one after completion of the revision plan. Every effort will be made to ensure that such a submission will be evaluated by the same editors and reviewers. The individual reviews are provided below for your reference. The manuscript by Philips et al. show data supporting an interesting role for HDAC3 in regulating the genomic preparedness for thymocyte lineage differentiation into the CD4 branch. These findings may provide a potentially rich source of future investigation points into this functionally crucial stage of differentiation, although as they stand, the data do not yet quite provide for the visualisation of a robust mechanistic pathway, which remains something of a limitation. Further, significant concerns regarding formal rigour also remain. If these limitations are addressed substantively, it would increase enthusiasm for publication in eLife. 1) The functional role of HDAC3 is revealed primarily in RORγT-null Bcl-xl-transgenic mice. While the argument for this complex genotypic background is reasonable, it leaves open an uncertainty about the role of HDAC3 in wild-type double-positive (DP) thymocyte differentiation. Even limited functional data supporting such a role in functional assays in closer-to-wild-type mice would be useful. 2) The lack of inclusion of a Rag1/2-null genotype in the OT-II experiments (Figure 1) leaves the formal possibility open that endogenous MHC class I-restricted TCRs have provided positive selection into the CD8 lineage. Data to rule out such a possibility would be helpful. 3) Does the alteration in identified super-enhancers in pre-selection immature-DP thymocytes from HDAC-3-null OT-II mice continue into the selecting-DP stage, or does it undergo further changes? 4) The ChIP-seq and RNA-seq data in Figure 2 have been done on background genotypes (OT-II and OT-II+HDCA3-null) that appear to be different from the ones used in Figure 1. It would be useful to provide data showing convergence between these various background genotypes. 5) In a number of instances, comparisons are offered between OT-II and OT-II-RB3 mice. It would be advisable to include OT-II-RB genotypes in these comparisons, to ensure formally that the major genotypic distinction is indeed in HDAC3. 6) The mechanistic model appears to be HDAC3-IL-21R-STAT5-PIAS. Is PIAS in fact essential for this specific functional role of HDAC3? As a related but separate question, does IL-21R expression and signaling precede the immature-DP super-enhancer alterations? Does the role of IL-21R in regulating genome-wide acetylation patterns indicate that acetylation is not driven directly by HDAC3? And instead, that HDAC3 has a limited role, for this function, in regulating IL-21R expression alone? Evidence for these mechanistic steps in mediating the final functional outcome of lineage choice would be very useful. 7) A cartoon of the mechanistic pathways involved would be very helpful, even if some of the steps in it remain speculative. HDAC3 deficient mice have defects in intrathymic selection, previously studied by these workers. In this work, the authors correct for defects in RORγT down regulation using mice deficient for RORγT and correct for the survival defect resulting from RORγT deficiency by introducing a transgene for Bcl-xl. Such mice were previously shown to produce only CD8 but not CD4 cells. Here, the MHC-II restricted TCR transgenic mice OT-II are shown to develop into the CD8 lineage when RORγT and HDAC3 is missing and a Bcl-xl transgene (OTII-RB3 mice) is present. Subsequent investigation largely uses a simpler OT-II TCR transgenic HDAC3 deficient model, and thymocytes that initiate TCR signaling are isolated and studied. 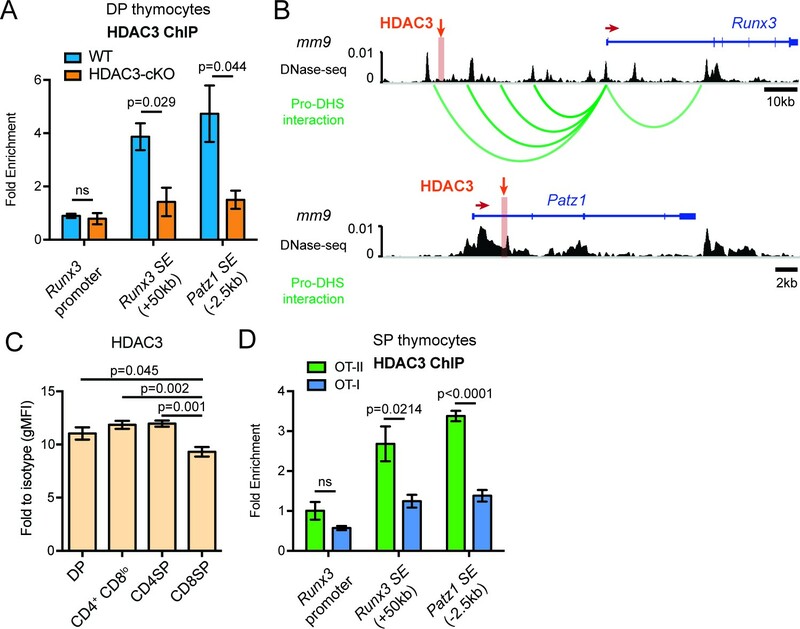 The authors find that HDAC3 deficiency leads to increased H3K27Ac deposition specifically on genes associated with the CD8 lineage. This is an interesting finding. Among these are genes for Runx3, which is critical for commitment to the CD8 lineage. Surprisingly, enhanced Runx3 expression is shown to be secondary to IL-21 signaling, as expression of the IL-21R receptor is enhanced on signaled thymocytes in OTII-RB3 mice, and this enhanced expression is reversed when antibody to IL-21R is injected into OTII-RB3 mice. Antibody blockade of IL-21R also reverses the changes in H3K27Ac, including the increased H3K27Ac at the Il21r locus. The authors suggest that HDAC3 is critical to restrain cytokine signaling in thymocytes, and in its absence IL-21 signaling leads to STAT5 activation, and so CD8 lineage commitment. How HDAC3 restrains Il21r cytokine signaling is unresolved. There are observations of interest here. One serious omission is that the authors do not appear to address whether blockage of IL-21R blocks CD8 development in OTII-RB3 mice. Further, the mechanism by which HDAC3 normally suppresses expression of IL-21R is also not resolved, because some measured changes in HDAC deficient cells are shown to be secondary to IL-21R signaling. Experiments would need to be repeated in the absence of IL-21R to address the mechanism of action of HDAC3. In summary, I believe the work is potentially of interest, but quite preliminary. Further insight into the role of HDAC3 and its putative role in control of IL-21R in thymocyte selection is needed. The importance of IL-21R signaling for CD8 development also needs to be better clarified. Philips et al. explore the role of HDAC3 in CD4/8 lineage commitment and reveal that HDAC3 loss causes a striking redirection of MHC-II restricted TCR Tg DP thymocytes to the CD8 fate. The authors go on to attempt to unravel the molecular basis for this highly penetrant phenotype, revealing changes in the expression of cytokine receptors and in responsiveness to cytokine signaling. Finally, the authors use an antibody blocking strategy to demonstrate the IL-21R signaling is responsible for changes in acetylation and STAT5 binding to the critical regulator of lineage fate, Runx3, in HDAC3-deficient mice. It was then concluded that HDAC3-deficiency regulates lineage commitment through effects on cytokine signaling, mostly likely IL-21R. The experiments are well controlled and thoughtfully interpreted. However, while authors have demonstrated some effects of HDAC3 loss on cytokine signaling, they did not definitively demonstrate that this was the cause of altered lineage fate, as they made no attempt to normalize cytokine signaling in HDAC3 mice and link this to restoration of CD4 lineage commitment. If the effect of HDAC3 on IL-21R expression and responsiveness is thought to play a key role, then it should be possible to extend the IL-21R blockade and examine effects on lineage commitment. 1) How HDAC3 restrains IL-21R cytokine signaling remains unresolved. – determine if HDAC3 overexpression inhibits transcriptional activation of an IL-21R reporter construct. HDAC3 binding at the Il21r promoter in human CD4 T cells and mouse pro-B cells. Accession numbers for publicly accessible HDAC3 ChIP-seq: human CD4 T cells (GSM393952) and mouse pro-B cells (GSM2096648). Also, does IL-21R expression and signaling precede the immature-DP super-enhancer alterations? To determine whether IL-21R expression and signaling occurs prior to DP thymocytes, we examined IL-21R expression and pSTAT5 signaling in DN (CD4-CD8-) and immature SP (ISP; CD8+CD4-TCRb-) thymocytes from WT and HDAC3-cKO mice. We found no change in IL-21R expression in DN thymocytes between mice, however ISPs from HDAC3-cKO mice exhibited a significant increase in IL-21R expression compared to WT mice. Of note, the level of IL-21R expression in ISPs from HDAC3-cKO mice was less than what was observed in DP thymocytes. In addition, upon IL-21 stimulation, ISPs from HDAC3-cKO mice exhibited a significant increase in phospho-STAT5 levels compare to WT mice, while stimulation with IL-4, IL-7, and IL-15 showed no effect. Therefore, IL-21R expression and signaling does precede the DP stage. This figure can be added to the supplemental data as Figure 5—figure supplement 2. Does the role of IL-21R in regulating genome-wide acetylation patterns indicate that acetylation is not driven directly by HDAC3? And instead, that HDAC3 has a limited role, for this function, in regulating IL-21R expression and/or signaling alone? – We will examine a larger subset of sites of increased histone acetylation at CD8 lineage genes to determine the relative contribution of IL-21R. The identification of sites of histone acetylation that are independent of IL-21 would demonstrate that there are effects independent of IL-21. The mechanistic model appears to be HDAC3-IL-21R-STAT5-PIAS. Is PIAS in fact essential for this specific functional role of HDAC3? Evidence for these mechanistic steps in mediating the final functional outcome of lineage choice would be very useful. A cartoon of the mechanistic pathways involved would also be very helpful. A cartoon of our model is shown in Author response image 2. Our model is that HDAC3 is a direct inhibitor of IL-21R, keeping expression low in WT DP thymocytes. In the absence of HDAC3, IL-21R levels increase, leading to enhanced Stat5 activation, Runx3 expression and CD8 lineage commitment. We demonstrate there is decreased PIAS3 in HDAC3-deficient DP thymocytes by RNA-seq. In the discussion, we speculate as to a role of PIAS to potentially potentiate Stat5 activation observed due to IL-21R signaling. Direct examination to determine the relative contribution of PIAS3 would require substantial interbreeding beyond the scope of this manuscript and will be addressed in future studies. If desired by the reviewers, the speculation in the discussion can be removed. Blocking antibodies may or may not be sufficient to eradicate all signaling. In order to determine the relative contribution of IL-21 receptor signaling to CD8-lineage commitment in OT-II RB3 mice, we will transfer bone marrow from OT-II RB3 mice (or OT-II controls) into IL-21-cytokine-knockout recipients. Bone marrow chimeras will be analyzed for lineage redirection in the thymus and spleen. A previous study showed that thymic epithelial cells, rather than haematopoietically-derived cells, are the source of IL-21 in the thymus (Rafei et al., 2013). Therefore, using bone marrow chimeras with the host thymic stroma deficient in IL-21 can address whether removing IL-21 may restore CD4-lineage development in OT-II RB3 mice. Cryopreserved IL-21 heterozygous mice were ordered from JAX, and these mice were recently received. We are currently interbreeding in our facility to generate IL-21-homozygous-knockout specifically for this experiment. One caveat is that IL-4R expression is also significantly higher in HDAC3-deficient DP thymocytes (Figure 5A) and IL-4 leads to enhanced Stat5 activation (although this was not quite statistically significant). We will also examine whether there is enhanced IL-4R expression and signaling in the HDAC3-deficient thymocytes in an IL-21-deficient recipient. There are almost no SP cells generated in CD2-icre HDAC3 cKO mice, due to an inability to pass positive selection (see Author response image 3). Therefore, lineage commitment cannot be examined in this mouse. Very few SP thymocytes are generated in CD2-icre HDAC3-cKO mice. 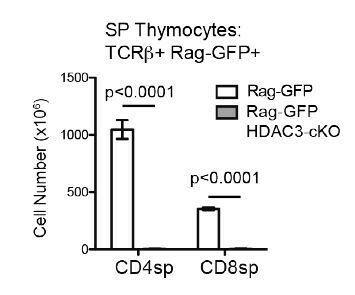 Cell count of CD4SP and CD8SP thymocytes from Rag-GFP and Rag-GFP CD2-icre HDAC3-cKO mice. SP thymocytes were gated on Rag-GFP+ to remove recirculating (GFP-) T cells in the thymus. Graph shows mean +/- SEM of 5 mice/group. We understand the reviewers’ concerns as we had not interbred to regenerate a Rag-deficient OTII RB3 (CD2-icre Hdac3 cKO RORγT KO Bcl-xl tg). In order to exclude examination of endogenously rearranged TCR in OT-II tg experiments, we utilized a gating scheme that analyzed only Vβ5+ Vα2+ cells in Figures 1 and 4 to restrict analysis primarily to OTII expressing T cells. Our sorts for ChIP-seq and RNA-seq analysis utilized Vβ5 as shown in Figure 2. Therefore, we do not expect there to be a significant number of endogenously rearranged TCRs that express Vβ5 and Vα2 within these gates. However, if desired by the reviewers, we can perform bone marrow chimeras in which bone marrow from OT-II RB3 mice or OT-II controls will be transferred into irradiated β2m-knockout recipients. Thymocytes from β2m-knockout mice largely fail to positively select MHC class I-restricted TCRs, leading to the development of only CD4 T cells (Broussard et al., 2006, their Figure 4A). We propose the bone marrow chimera experiment, as opposed to introducing a Rag1/2-null genotype into OT-II RB3 mice, as the time it would take to complete the interbreeding to six alleles with additional experiments would not be feasible for this revision. The alterations observed in OT-II HDAC3-cKO mice are also observed in OT-II RB3 mice. The ChIP-seq and RNA-seq demonstrated that prior to positive selection, OT-II HDAC3-cKO mice exhibited a bias for the CD8-lineage. This was also observed at the protein level, where Selecting thymocytes (Vβ5lo CD69+) from OT-II HDAC3-cKO mice exhibited an increase in Runx3 protein expression and a decrease in ThPOK protein expression compared to OT-II Selecting cells (Figure 2—figure supplement 2D). This is consistent with the observation that OT-II RB3 mice exhibit an increase in Runx3 and a decrease in ThPOK expression in CD69-positive CCR7-low thymocytes (Figure 4). In addition, OT-II HDAC3-cKO mice and OT-II RB3 mice both express IL-21R in DP thymocytes at a significantly higher level compare to OT-II mice (see Author response image 4). We will need to perform additional experiments to increase our N for the provided figure (we currently have an N of 2). Furthermore, DP thymocytes from OT-II RB3 mice also show elevated p-STAT5 levels after IL-21 stimulation compared to OT-II mice, similarly to OT-II HDAC3-cKO mice (see Author response image 4). Therefore, OT-II HDAC3-cKO mice and OT-II HDAC3-cKO mice converge in their expression of lineage-determining transcription factors in CD69+ cells, increased expression of IL-21R in DP thymocytes, and elevated STAT5 activation in DP cells. This data will be added to the manuscript. OT-II RB3 mice show increased IL-21R expression and IL-21-induced STAT5 activation. (A) IL-21R expression on DP thymocytes from OT-I, OT-II, and OT-II RB3 mice. (B) p-STAT5 expression in DP cells from OT-I, OT-II, and OT-II RB3 mice that were stimulated with the indicated cytokines for 10mins. Experimental conditions are the same as performed in Figure 5E. Bar graph shows mean +/- SEM. N=2 mice/group. In the submitted manuscript, we had included the OT-II RB control when OT-II and OT-II RB3 mice are compared in Figure 1. In the manuscript, the main comparisons made between OT-II and OT-II RB3 mice are (1) CD4-vs-CD8 profile of mature SP and peripheral T cells in Figure 1A, (2) expression of Runx3 and ThPOK in SP thymocytes in Figure 1B, (3) whether SP cells produce granzyme b and perforin in Figure 1D, and (4) the expression of Runx3, CD8α, and ThPOK during the 2 phases of lineage commitment in Figure 4. The manuscript currently includes an OT-II RB control for Figure 1A, however we can add additional controls to the rest of the figures. As shown in Author response image 5, we find that OT-II RB mice downregulate CD8α and fail to induce Runx3 during lineage commitment similarly to OT-II mice. We will need to perform additional experiments to increase our N for measuring CD8α and Runx3 during lineage commitment (for addition to Figure 4, we currently have an N of 2 for OT-II RB). In addition, we will measure granzyme b and perforin production in OT-II RB mice (for addition to the comparison of OT-II and OT-II RB3 in Figure 1D), and ThPOK (to be added to Figure 1B). Expression of Runx3 and CD8α during stages of lineage commitment (Stages 1-6), from OT-I, OT-II, and OT-II RB3 straight bone marrow chimeras. CD69-versus-CCR7 plots were gated from DN-removed, CD45.2+ cells. Plots show mean ± SEM of MFI from 4-5 mice per group from three independent experiments, except N=2 mice for OT-II RB. As the revision of our original submission required bone marrow chimera experiments to address a reviewer’s concern, as well as additional breeding of mice with complex genotypes, we could not complete our revision in the 2-month time limit for eLife. However, we welcomed the opportunity to revise and submit our manuscript after this window. We appreciate the time and effort devoted by the reviewers and editors. As γc cytokines have an established and critical role in CD8 lineage commitment, we initially focused on the role of enhanced IL-21R expression in CD8 lineage commitment. Based on the reviews, a longer 14-day time course of IL-21R blockade was performed to analyze changes in CD4/CD8 lineage commitment, ThPOK and Runx3 expression in OT-II and OT-II RB3 mice. 14-day blockade of IL-21R did not alter OT-II RB3 lineage commitment to CD8 or modulate expression of either ThPOK or Runx3. This data has been added as Figure 6, and the previous data on changes in histone acetylation has been removed. Therefore, blockade of IL-21R is insufficient to normalize lineage commitment in the absence of HDAC3, and HDAC3 must have additional mechanisms for regulation of CD8 lineage commitment. We have now added HDAC3 ChIP-qPCR studies, and demonstrate that HDAC3 binds to the Runx3, Patz1 and IL-21R loci in DP thymocytes, showing a direct role for HDAC3 in the regulation of these genes. In addition, we examined the binding of HDAC3 at Runx3 and Patz1 loci in (HDAC3-sufficient) OT-I CD8 SP thymocytes and OT-II CD4-SP thymocytes. Similar to WT DP thymocytes, HDAC3 remained bound to Runx3 and Patz1 loci in OT-II CD4 SP thymocytes. However, very little HDAC3 bound to the Runx3 and Patz1 loci in OT-I CD8 SP thymocytes, indicating that HDAC3 must be removed from these loci in the CD8 lineage. This data has been added as Figure 7 in the manuscript. Therefore, we conclude that HDAC3 restrains multiple CD8-lineage genes in DP thymocytes to allow for appropriate CD4/CD8 lineage commitment. What follows is our point-by-point response to the Essential Revisions. We now show that HDAC3 directly associates with the IL-21R promoter by qChIP. Also, does IL-21R expression and signalling precede the immature-DP super-enhancer alterations? To determine whether IL-21R expression and signaling occurs prior to DP thymocytes, we examined IL-21R expression and pSTAT5 signaling in DN (CD4-CD8-) and immature SP (ISP; CD8+CD4TCRb-) thymocytes from WT and HDAC3-cKO mice. We found no change in IL-21R expression in DN thymocytes between mice, however ISPs from HDAC3-cKO mice exhibited a significant increase in IL-21R expression compared to WT mice (now added as new Figure 5—figure supplement 2). Of note, the level of IL-21R expression in ISPs from HDAC3-cKO mice was less than what was observed in DP thymocytes. In addition, upon IL-21 stimulation, ISPs from HDAC3cKO mice exhibited a significant increase in phospho-STAT5 levels compare to WT mice, while stimulation with IL-4, IL-7, and IL-15 showed no effect (included in new Figure 5—figure supplement 2). Therefore, IL-21R expression and signaling does precede the DP stage. 14-day IL-21R blockade did not revert lineage commitment or altered ThPOK or Runx3 expression in OT-II RB3 mice. Thus, the function of HDAC3 in lineage commitment is not solely due to upregulation of IL-21R. As mentioned above, we now demonstrate that HDAC3 directly binds to Runx3 and Patz1 loci by ChIP. Therefore, HDAC3 constrains multiple CD8 lineage genes in DP thymocytes and that HDAC3 is required for DP thymocytes to maintain a bi-potential state that allows subsequent CD4 lineage commitment for Class II-restricted, positively-selected thymocytes. The mechanistic model appears to be HDAC3-IL-21R-STAT5-PIAS. Is PIAS in fact essential for this specific functional role of HDAC3? Evidence for these mechanistic steps in mediating the final functional outcome of lineage choice would be very useful. We have removed speculation on the role of PIAS from the manuscript. A cartoon of the mechanistic pathways involved would also be very helpful. A model has been added as new Figure 7—figure supplement 2. As stated above, 14-day IL-21R blockade did not restore lineage commitment in OTII-RB3 mice. IL-21R blockade also did not normalize expression of Runx3, as Runx3 protein expression was still increased in the absence of HDAC3. We now show by HDAC3 ChIP-qPCR that HDAC3 binds to Runx3, Patz1 and IL-21R loci. Therefore, there multiple effects of HDAC3 genes that regulate CD8 lineage commitment, and blocking IL-21R alone is insufficient. 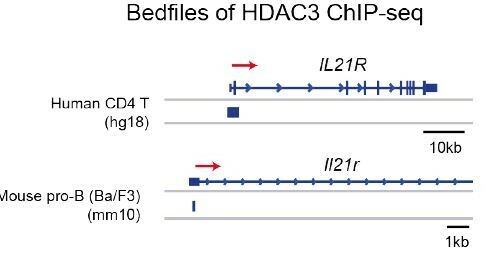 The IL-21R blockade data has been added to Figure 6 and HDAC3 qChIP added to Figure 7. However, to understand the role of HDAC3 in WT DP thymocyte differentiation, we performed HDAC3 qChIP at the Runx3 and Patz1 loci in WT DP thymocytes (Figure 7A), OT-II CD4 SP thymocytes (Figure 7D) and OT-I CD8 SP thymocytes. HDAC3 binds to the Runx3 and Patz1 loci in WT DP thymocytes, and this binding is maintained in OT-II CD4 SP thymocytes. However, there is a dramatic decrease in HDAC3 binding to the Runx3 and Patz1 loci in OT-I CD8 SP thymocytes, indicating that HDAC3 is removed from these sites in the normal process of CD8 lineage commitment but maintained in CD4 lineage commitment. We understand the reviewers’ concerns as we had not interbred to regenerate a Rag-deficient OTII RB3 (CD2-icre Hdac3 cKO RORγt KO Bcl-xl tg). In order to exclude examination of endogenously rearranged TCR in OT-II tg experiments, we utilized a gating scheme that analyzed only Vβ5+ Vα2+ cells in Figures 1 and 4 to restrict analysis primarily to OTII expressing T cells. Our sorts for ChIP-seq and RNA-seq analysis utilized Vβ5 as shown in Figure 2. Therefore, we did not expect there to be a significant number of endogenously rearranged TCRs that express Vβ5 and Vα2 within these gates. To address this point, we generated bone marrow chimeras in which bone marrow from OT-II RB3 mice or OT-II controls were transferred into irradiated β2m-knockout recipients. Thymocytes from β2m-knockout mice largely fail to positively select MHC class I-restricted TCRs, leading to the development of only CD4 T cells (Broussard et al., 2006, their Figure 4A). OTII-RB3 thymocytes within a β2m-knockout environment generated CD8+ mature SP thymocytes, similarly to OTII-RB3 thymocytes in a WT environment. Thus, the effects that we observe are not due to endogenous MHC class-I restricted TCRs generated CD8 SP thymocytes in OTII-RB3 mice. These results have been added in Figure 1E in the manuscript. The alterations observed in OT-II HDAC3-cKO mice are also observed in OT-II RB3 mice. The ChIP-seq and RNA-seq demonstrated that prior to positive selection, OT-II HDAC3-cKO mice exhibited a bias for the CD8-lineage. This was also observed at the protein level, where Selecting thymocytes (Vβ5lo CD69+) from OT-II HDAC3-cKO mice exhibited an increase in Runx3 protein expression and a decrease in ThPOK protein expression compared to OT-II Selecting cells (Figure 3—figure supplement 2D). This is consistent with the observation that OT-II RB3 mice exhibit an increase in Runx3 and a decrease in ThPOK expression in CD69-positive CCR7-low thymocytes (Figure 2B). In addition, HDAC3-cKO mice and OT-II RB3 mice both express IL-21R in DP thymocytes at a significantly higher level compare to OT-II mice (Figure 5). Furthermore, DP thymocytes from OT-II RB3 mice also show elevated p-STAT5 levels after IL-21 stimulation compared to OT-II mice, similarly to HDAC3-cKO mice (now added as Figure 5—figure supplement 1). Therefore, OT-II HDAC3-cKO mice and OT-II RB3 mice converge in their expression of lineage-determining transcription factors Runx3 and ThPOK in CD69+ cells, increased expression of IL-21R in DP thymocytes, and elevated STAT5 activation in DP cells. CD8α, and ThPOK during the kinetics of lineage commitment in Figure 2 and (5) examination of IL-21R and p-STAT5 activation in Figure 5—figure supplement 1. In all cases, OT-II RB mice are similar to OT-II mice with respect to appropriate CD4 lineage commitment, demonstrating that the altered lineage commitment to CD8 in OT-II RB3 mice is due to loss of HDAC3. We thank Dr. Scott Hiebert for HDAC3 floxed mice. This work benefitted from data assembled by the Immunological Genome Consortium. We thank members of the Epigenomics Program and Medical Genome Facility within the Center for Individualized Medicine for their contributions to the generation of ChIP-seq and RNA-seq datasets. We also thank members of the VSS and Kay Medina (Mayo Clinic) laboratory for thoughtful discussions and critical reading of the manuscript. This work was supported by National Institutes of Health Grants R56 AI122746 and T32 AI007425, Center for Biomedical Discovery at Mayo Clinic, Mayo Graduate School funds to RLP, and Mayo Foundation funds to VSS. The authors do not have any conflicts of interest. Animal experimentation: This study was performed in strict accordance with the recommendations in the Guide for the Care and Use of Laboratory Animals of the National Institutes of Health. All of the animals were handled according to approved institutional animal care and use committee (IACUC) protocol (#A1984-16) of the Mayo Clinic. © 2019, Philips et al.